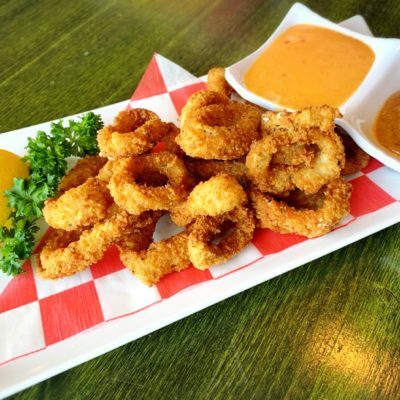 Fried calamari ring, lightly battered and deep-fried to goldenbrown and served with a sweet house made Asian dipping sauce. 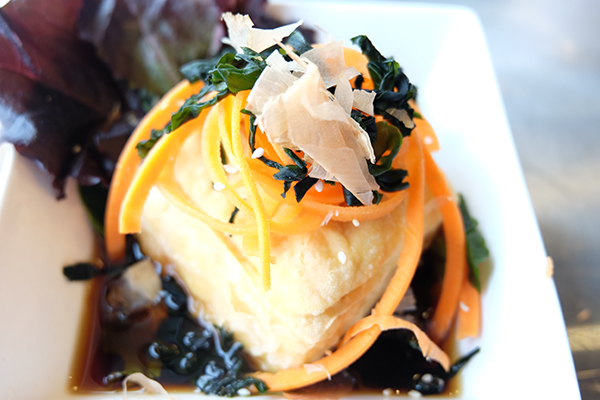 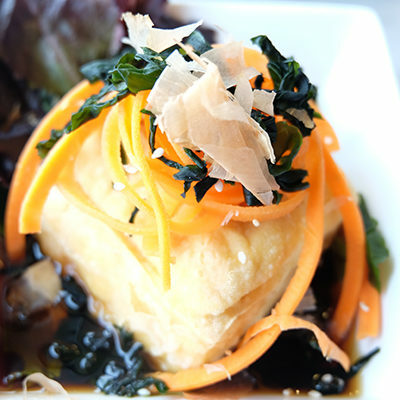 Fried Japanese style tofu with ginger and scallions, carrots, seaweed with tempura sauce. 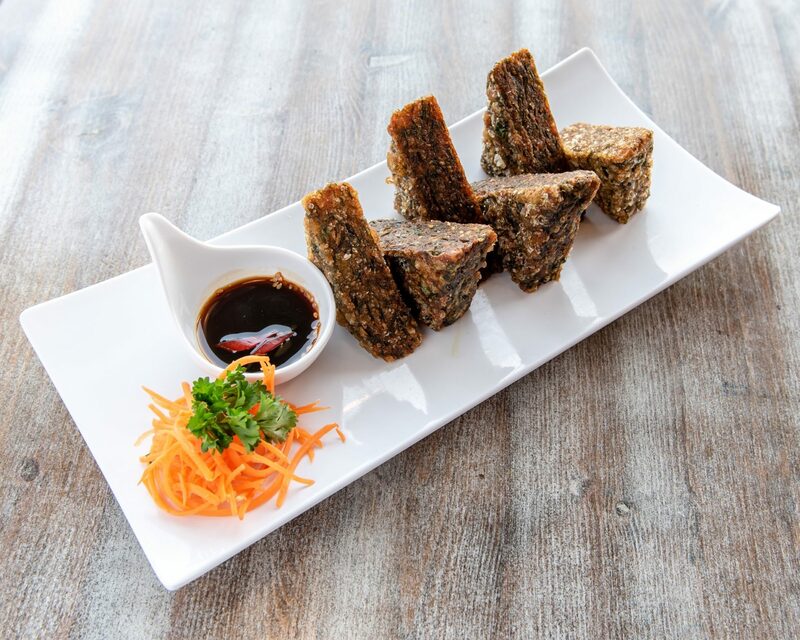 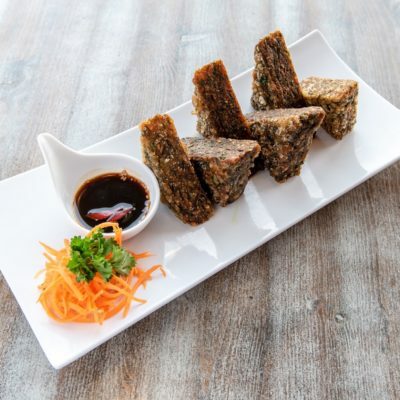 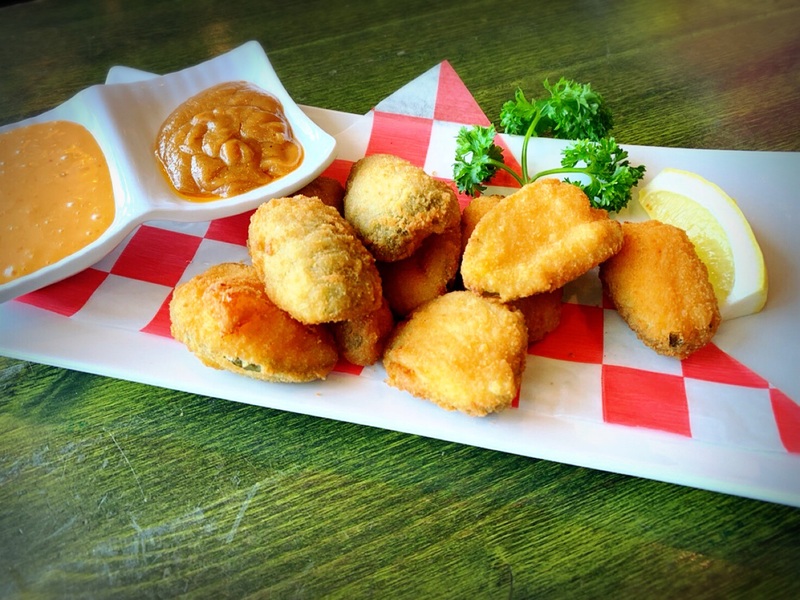 Deep fried Chinese chive cake, fried red onion, scallion, cilantro served with a homemade dipping sauce. 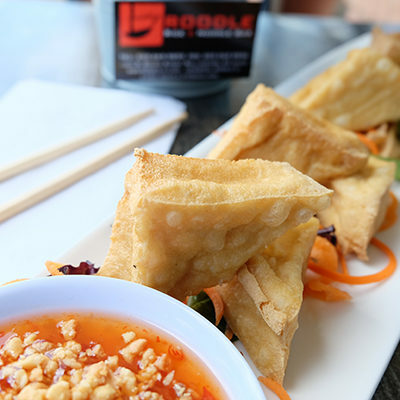 Fresh pearl tofu, bite-sized slices, deep-fried until golden brown severed with ground peanuts & sweet sauce. 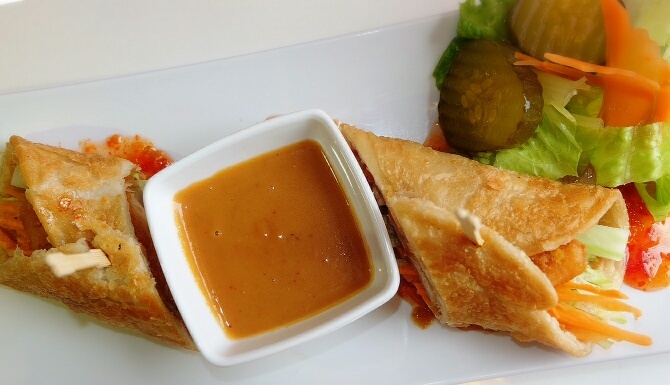 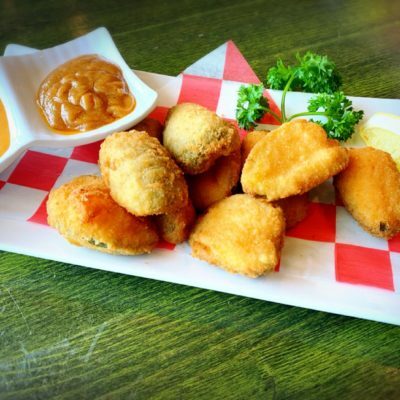 Spicy jalapenos filled with melty Cheddar cheese breaded and frind to perfection. 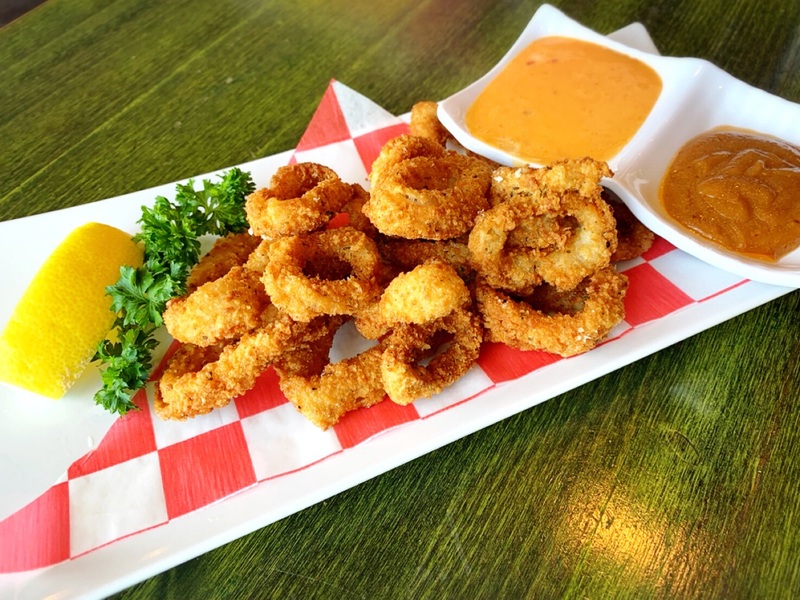 cool it off with a side dipping cup of creamy Asian Ranch dressing. 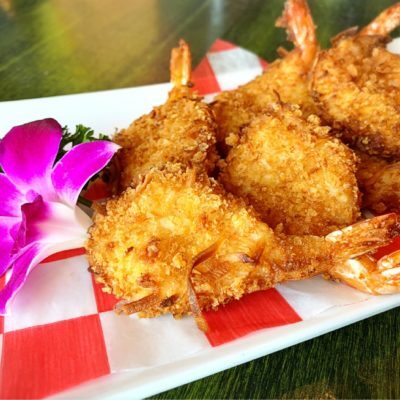 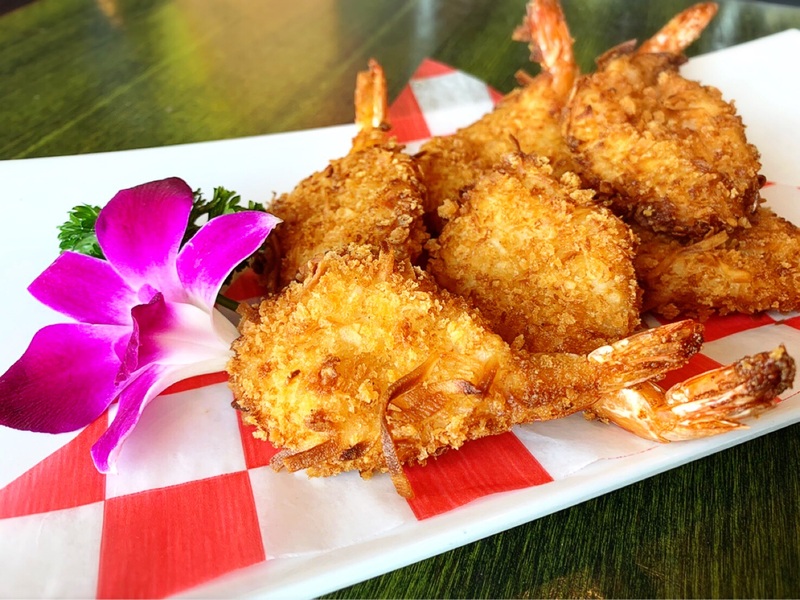 Fried coconut butterfly shrimp served with a sweet Asian sauce and Asian ranch dressing. 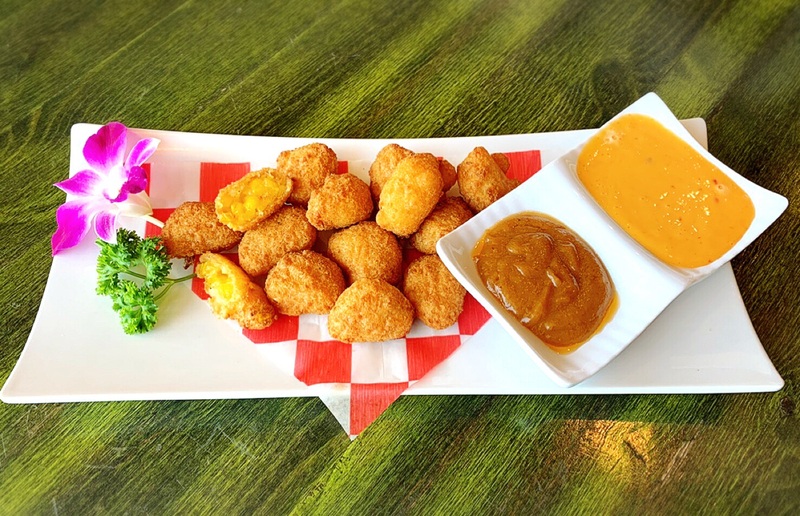 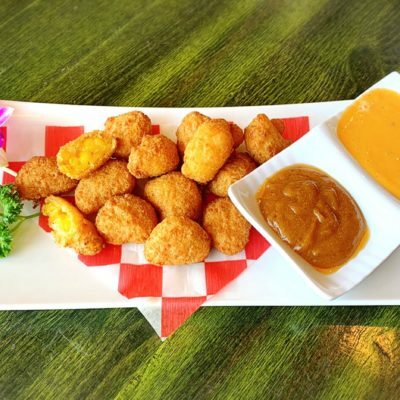 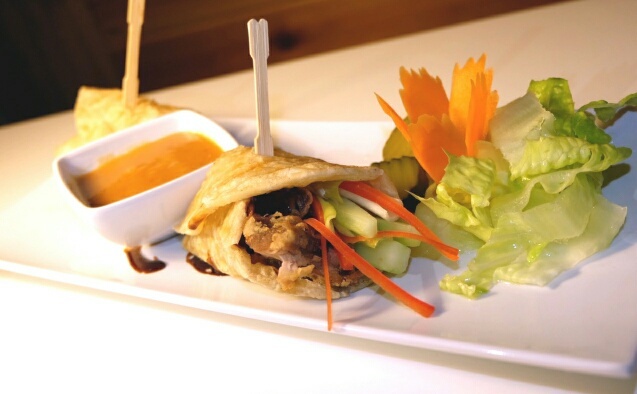 Sweet corn battered and fried in a crisp shell served with peanut sauce and Asian ranuch dressing for dipping. 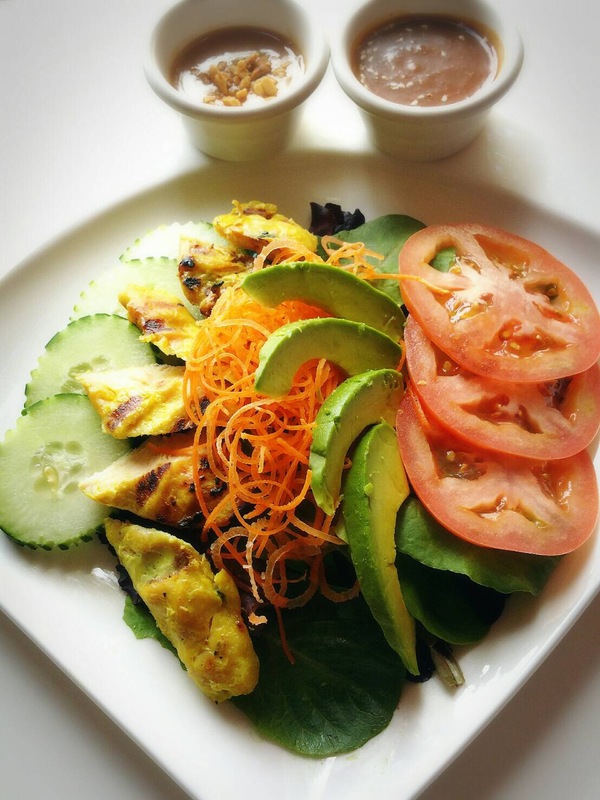 A colorful assembly of spring mix salad, tomatoes, cucumbers, carrots, avocado served with ginger and peanut dressing. 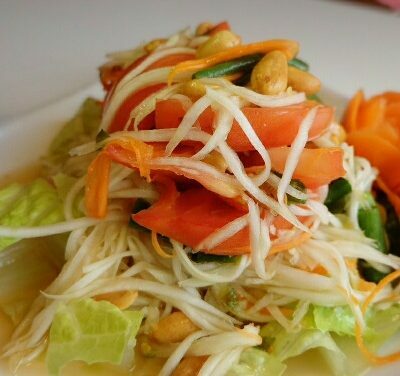 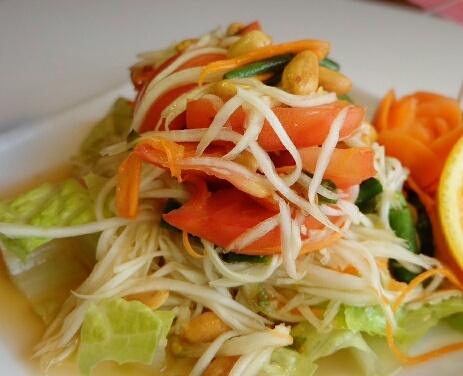 A mixture of shredded raw papaya, carrots, tomatoes, string beans and peanuts seasoned in spicy lemon sauce served with lettuce. 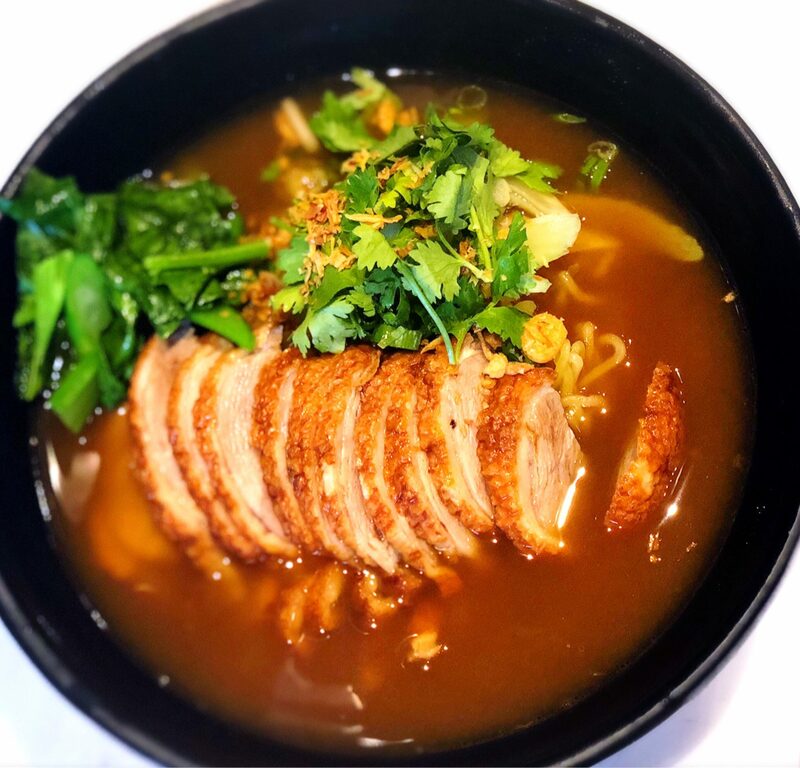 Egg noodles in aromatic five- spice broth with Chinese broccoli, bean sprouts, fried red onion, scallions, cilantro and white pepper. 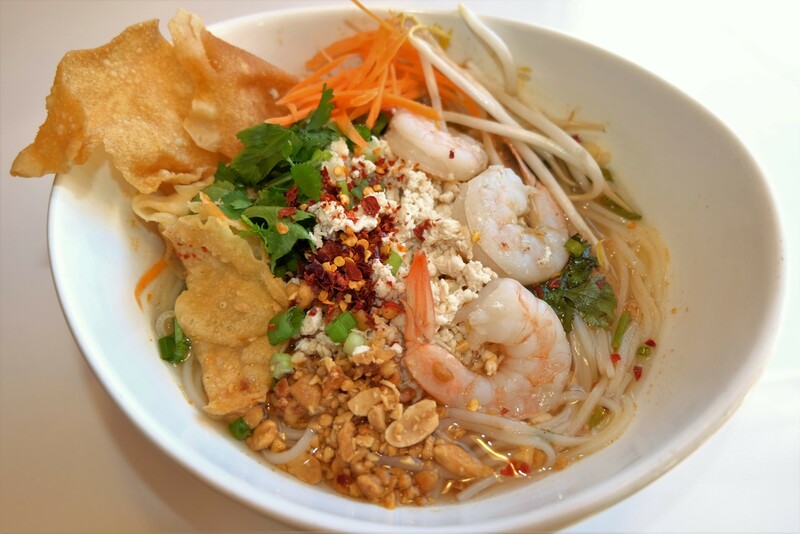 One of the most appetizing dishes, shrimp and ground chicken in hot and sour broth with fresh fettuccine rice noodles, bean sprouts, carrots, string beans, scallions, ground peanuts, cilantro, crispy wontons and chili paste. 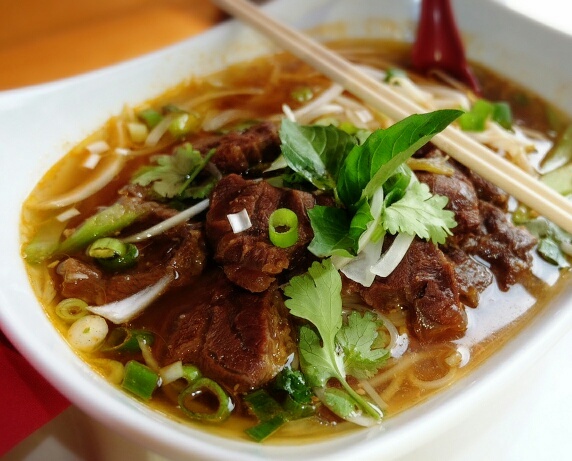 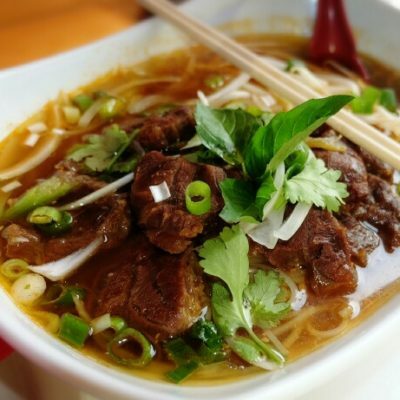 Beef Noodle soup with onions, basil leaves, scallions, bean sprouts, celery, and cilantro. 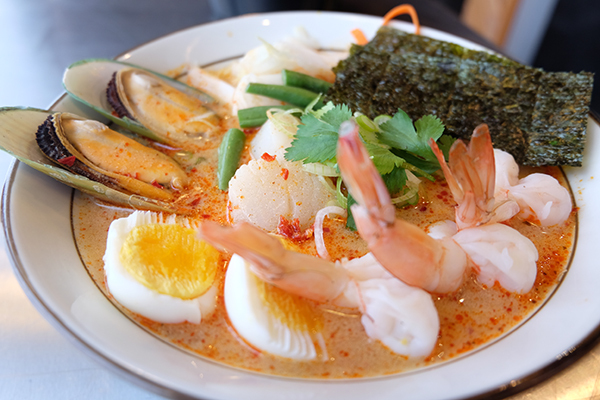 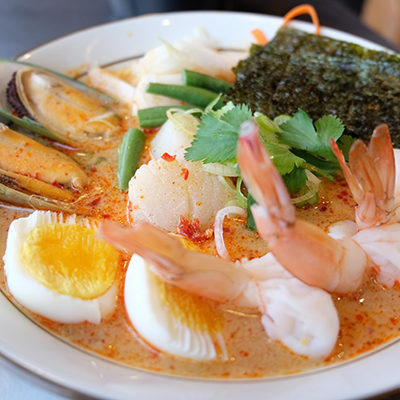 Hot & sour flavor with shrimp, scallop, mussel, squid, scallions, bean sprouts, carrot, napa cabbage, string bean, cilantro, nori and boiled egg. 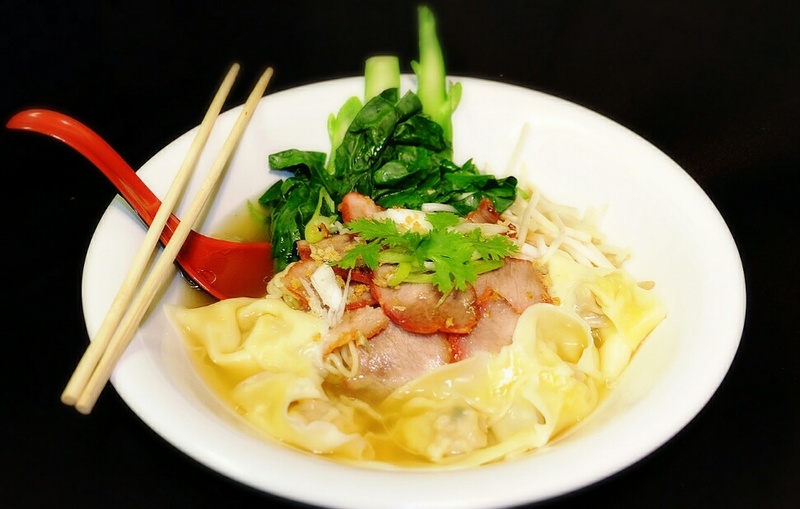 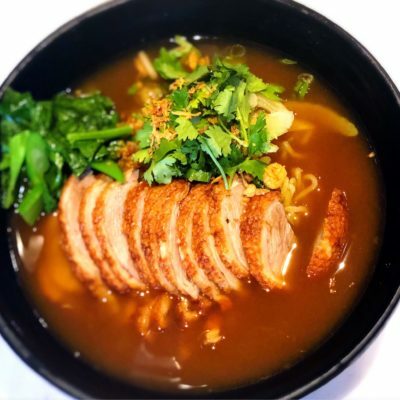 Egg noodle soup with Chinese broccoli, bean sprouts, scallions, pork wontons, cilantro and roasted pork. 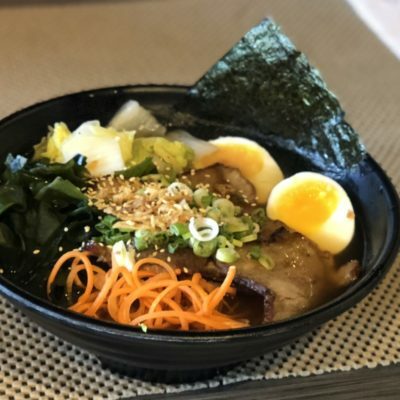 Slow cooker Pork Ramen with roasted pork, bean sprouts, boiled egg, scallion, napa cabbage, seaweed, carrot, nori, fried red onion and sesame seed. 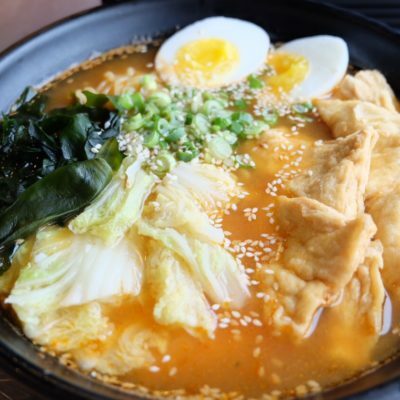 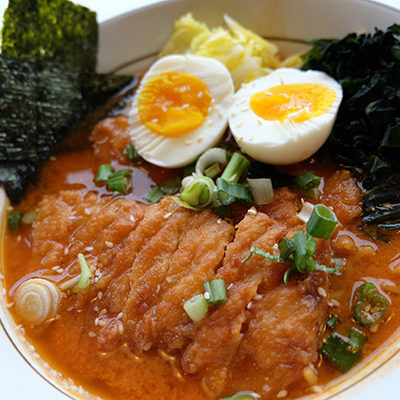 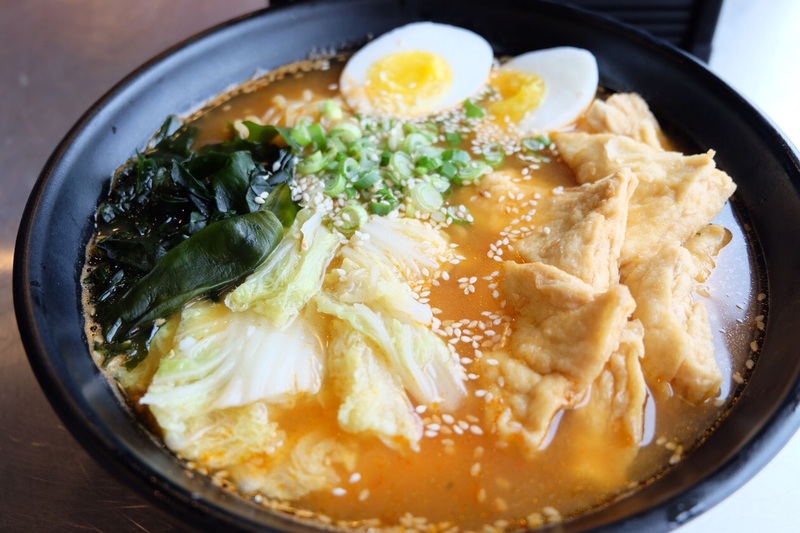 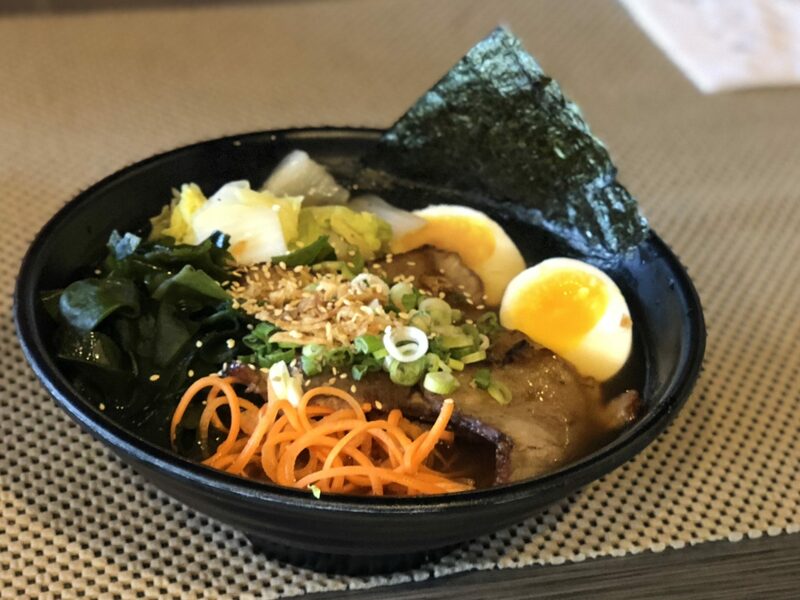 Chicken Ramen in red miso flavor soup served with nori, seaweed, scallion, napa cabbage, bean sprouts, sesame seed and boiled egg. 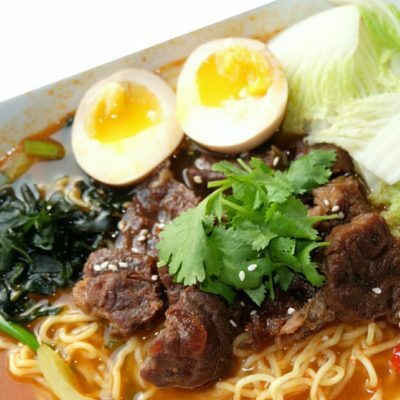 Beef stew sukiyaki with bean sprouts, seaweed, scallion & poached egg. 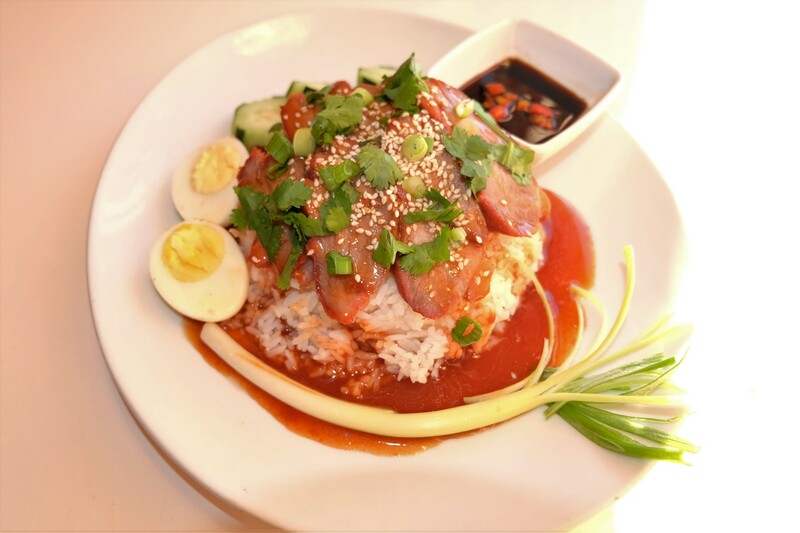 Roast pork, scallions, cilantro, boiled egg with homemade roast pork sauce and served with white rice. 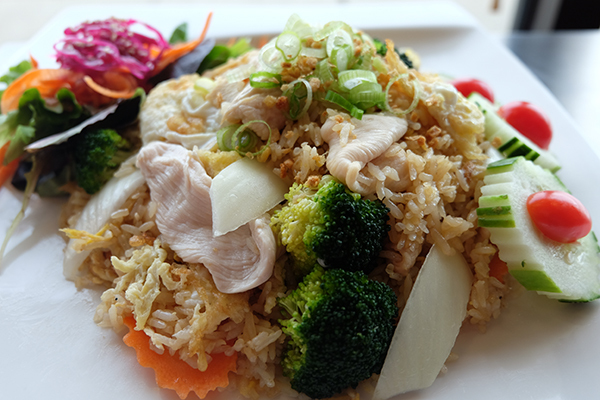 Stir-fried rice with chicken, carrots, egg, broccoli, onions, scallion & garlic in homemade sauce. 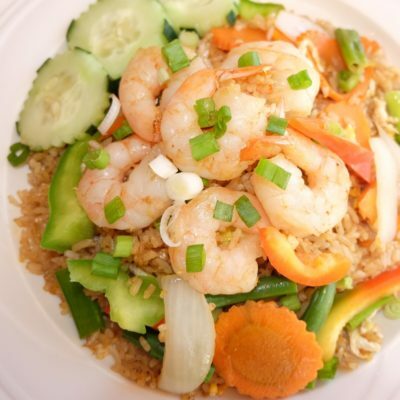 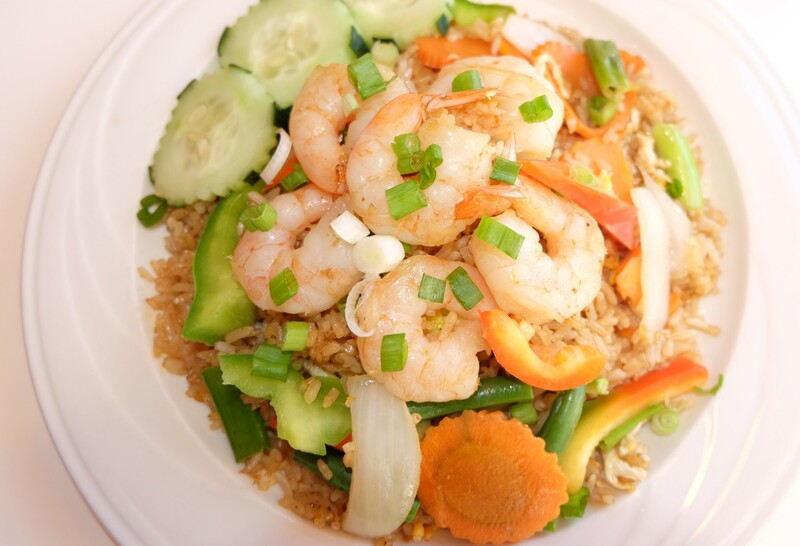 Shrimp fried rice with carrots, string bean, egg, bell pepper, scallion, onion, basil leaves in hot and sour flavor. 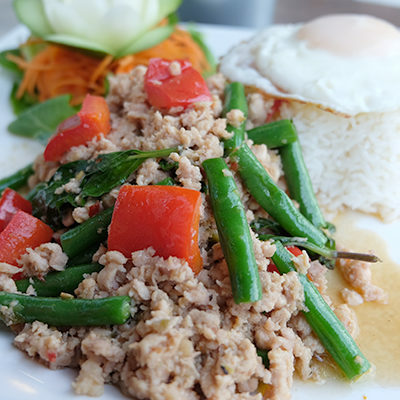 Pork fried rice with egg, string beans, bamboo shoots, zucchini, basil leaves and bell peppers in green curry sauce. 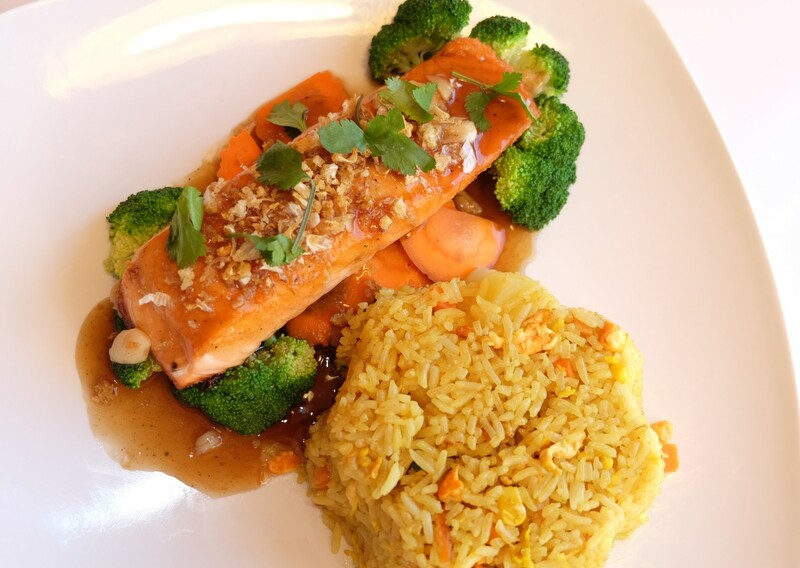 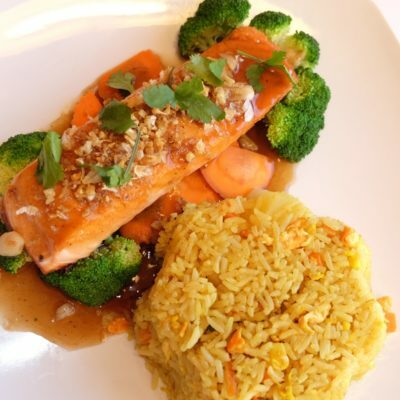 Charcoal – grilled salmon garnished with steamed vegetable served with pineapple fried rice. 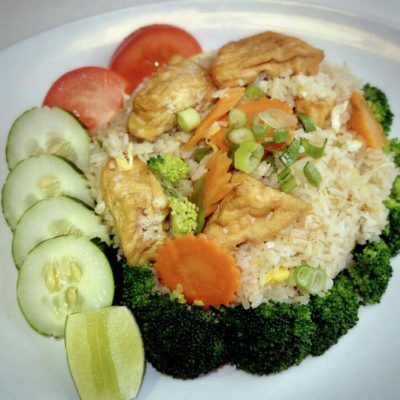 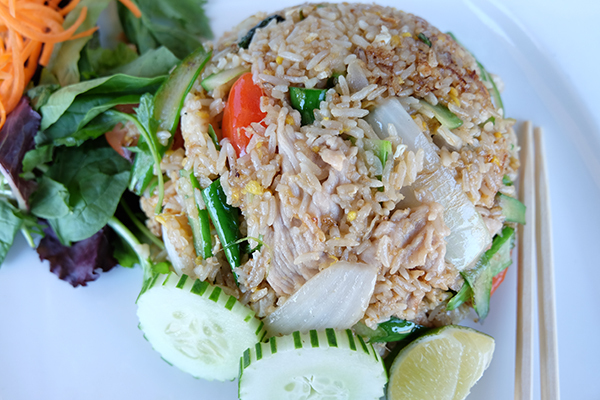 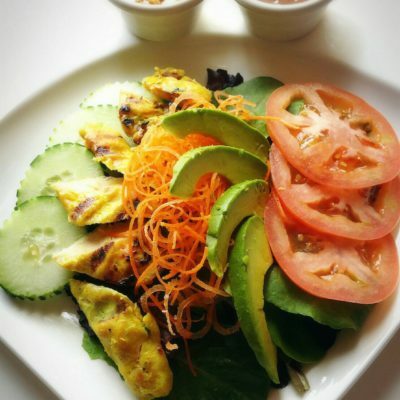 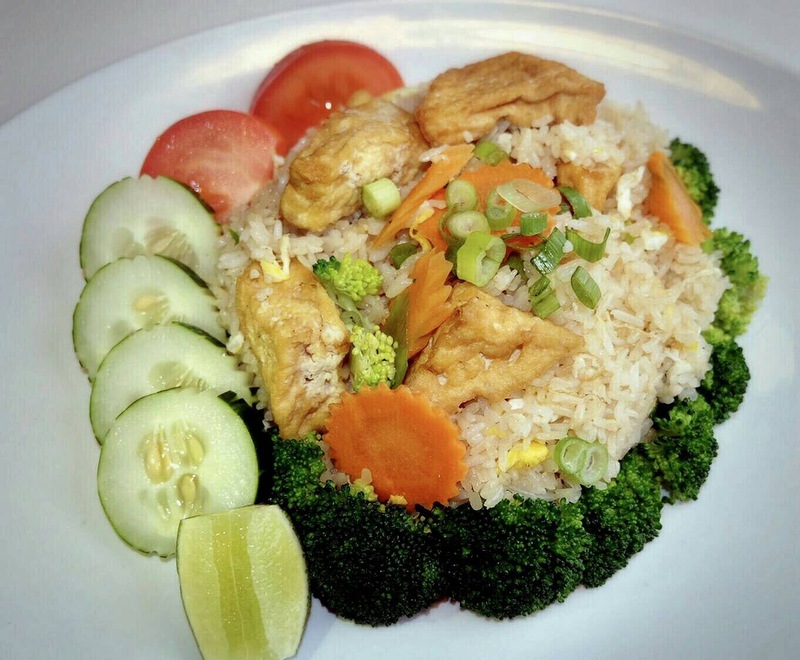 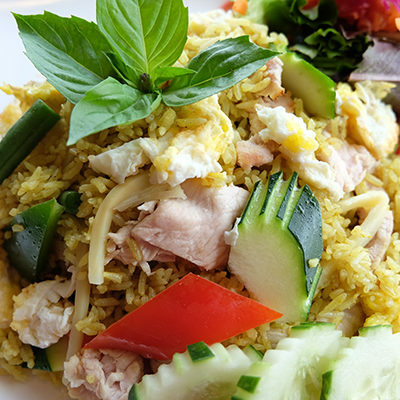 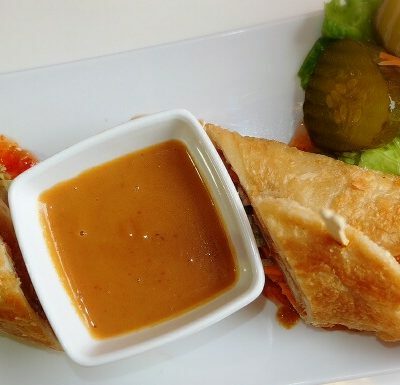 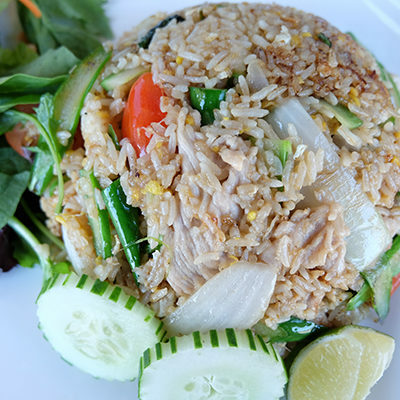 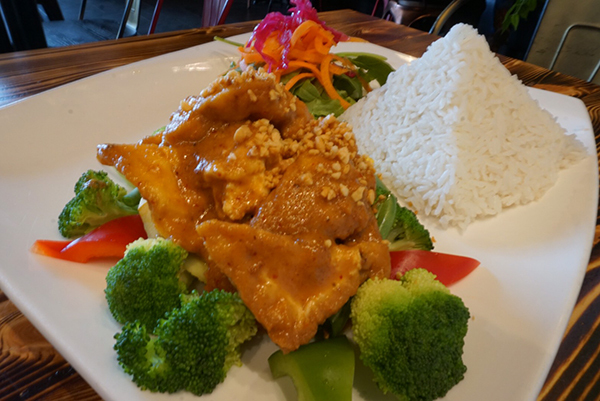 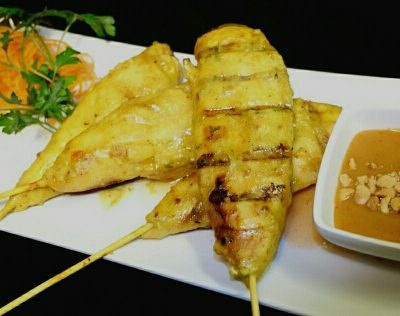 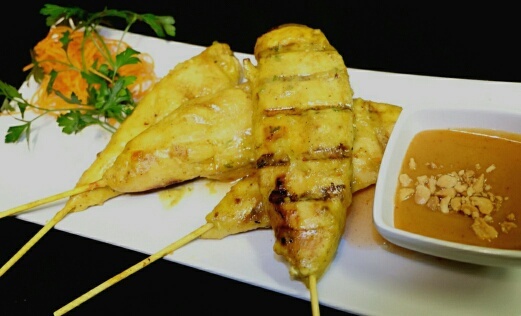 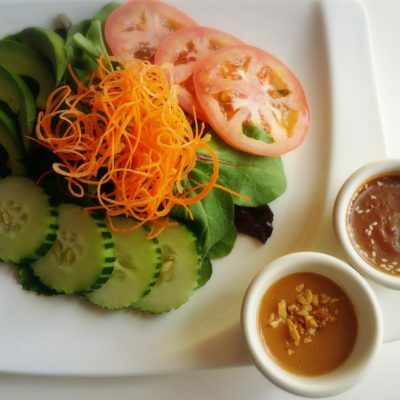 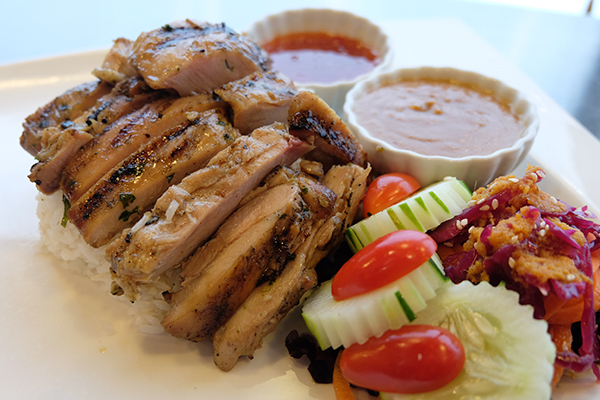 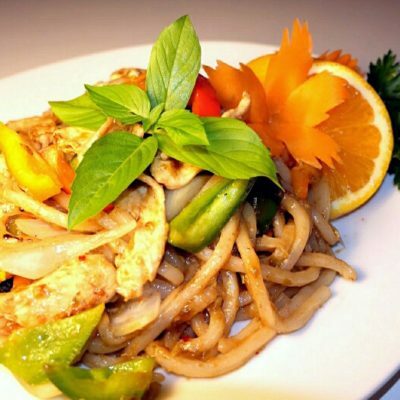 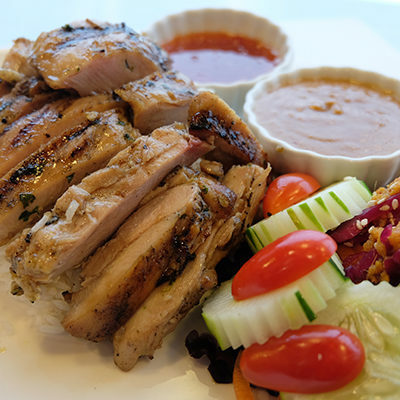 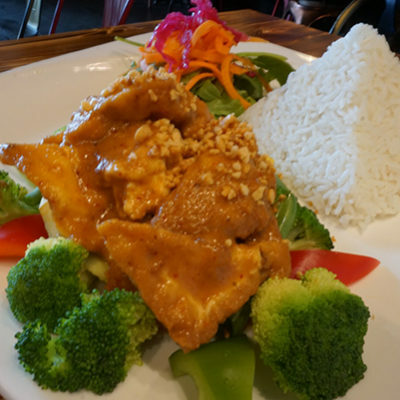 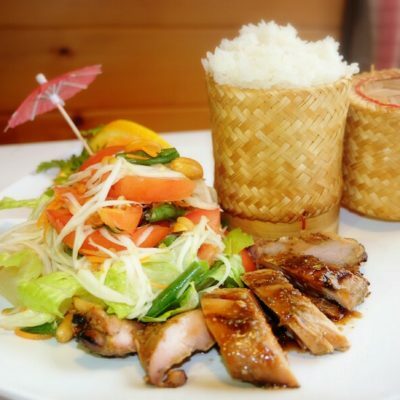 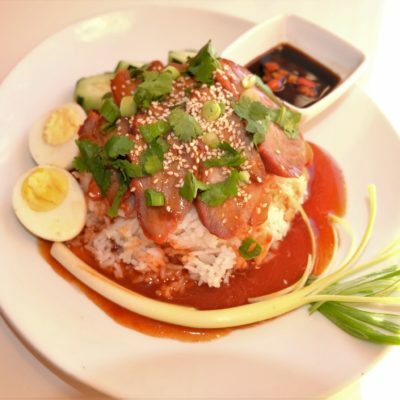 Charcoal – grilled garlic chicken served with mix salad, peanut sauce, sweet chili sauce and served with white rice. 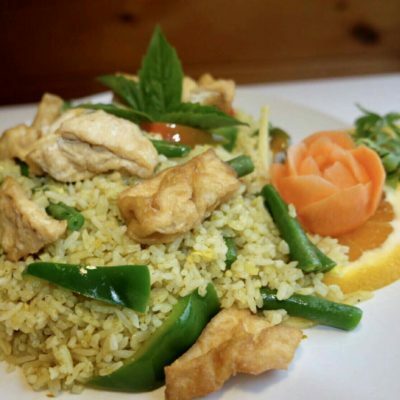 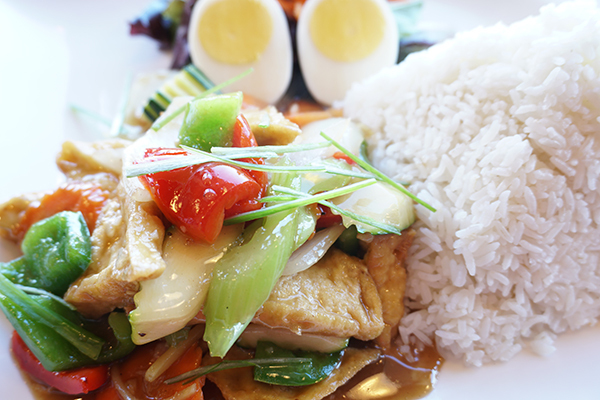 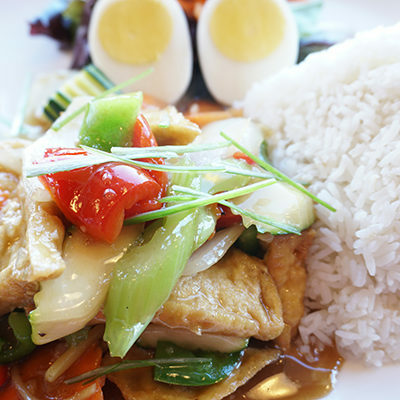 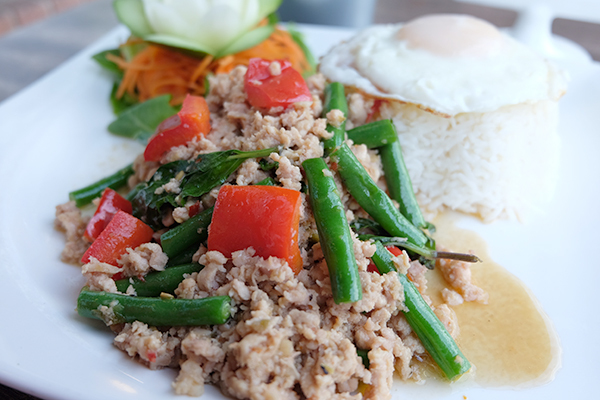 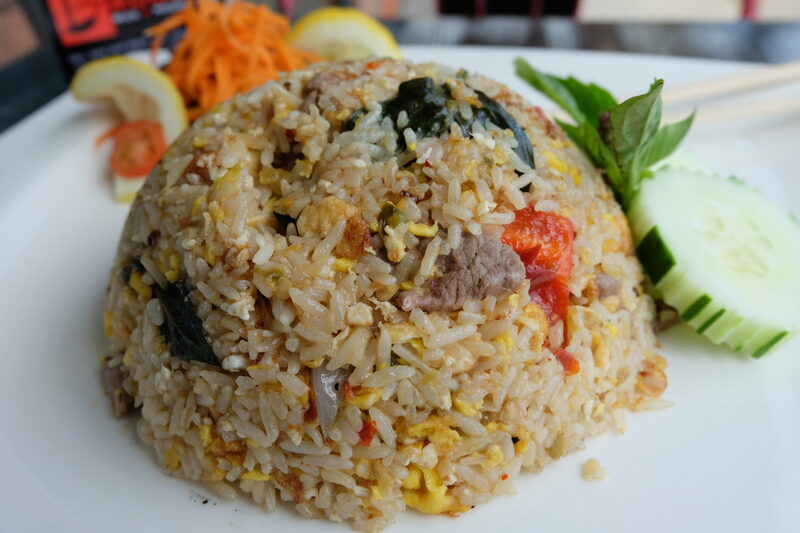 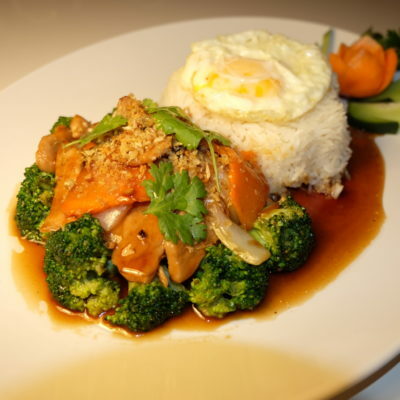 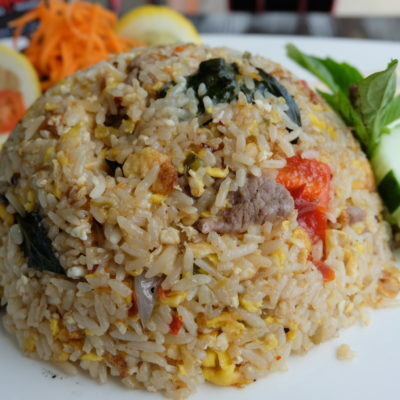 Flavorful sautéed ground chicken, string bean, garlic, chili, basil leaves, bell pepper, fried egg served with white rice. 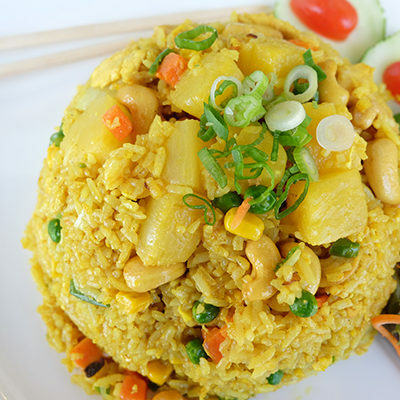 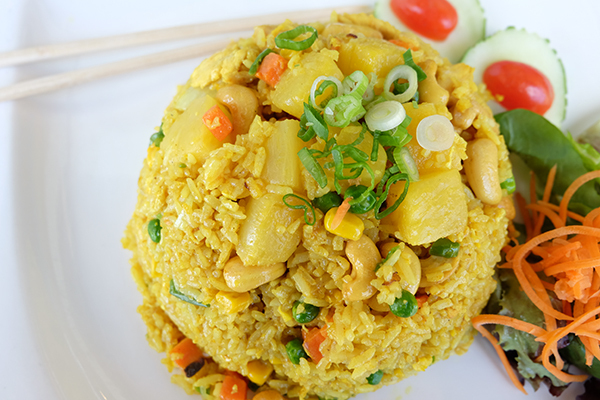 Stir-fried rice with pineapple, curry powder, cashew nut, peas, corn, scallions, onions, carrots and egg. 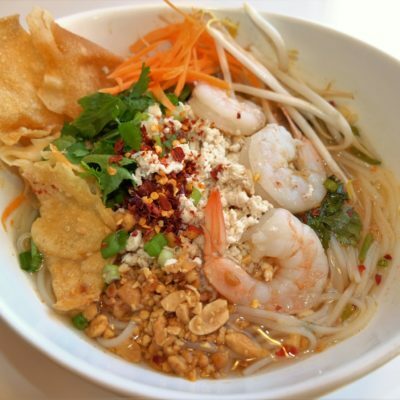 Classic stir-fried rice noodle with bean sprouts, scallions, egg and peanut. 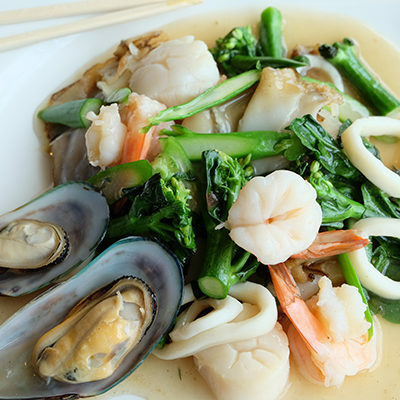 Thai gravy noodle with seafood, Chinese broccoli topped on wide rice noodles. 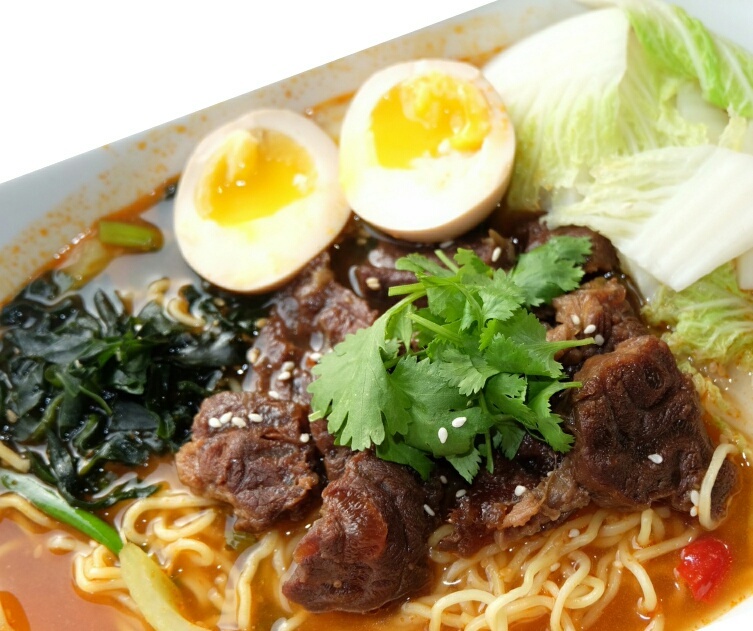 Delicious flat wide noodles with beef, basil leaves, bell peppers, carrots, egg, onions in spicy chili garlic sauce. 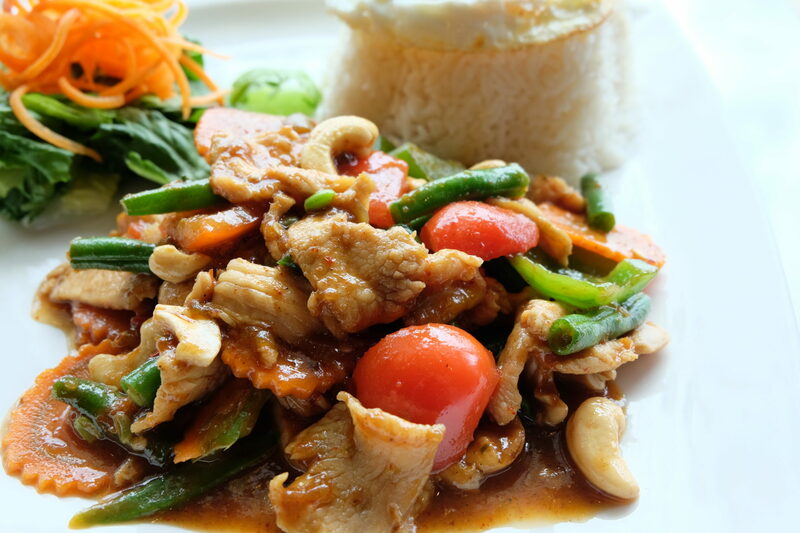 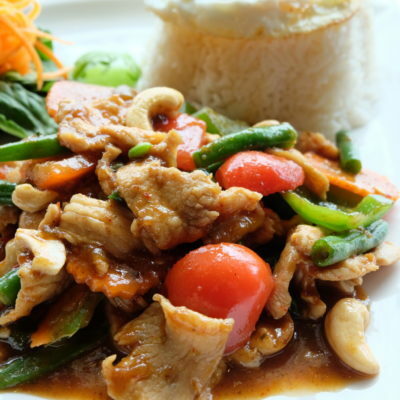 Stir-fried chicken, string beans, carrots, cashew nuts and bell peppers in Thai Traditional roasted chili sauce, fried egg an served with white rice. 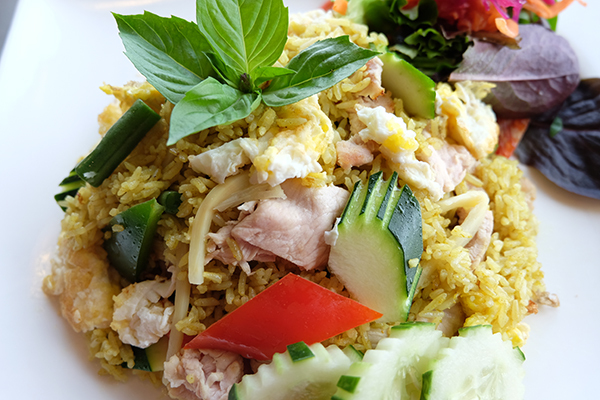 Stir-fried rice with bell peppers, onions, basil leaves, egg and chilli. 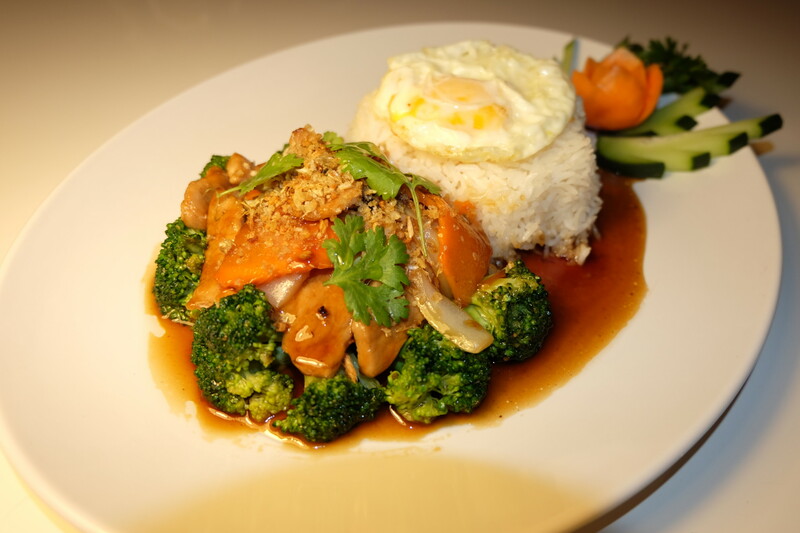 Sautéed Teriyaki pork with broccoli, onions carrots in brown sauce top with fried egg. 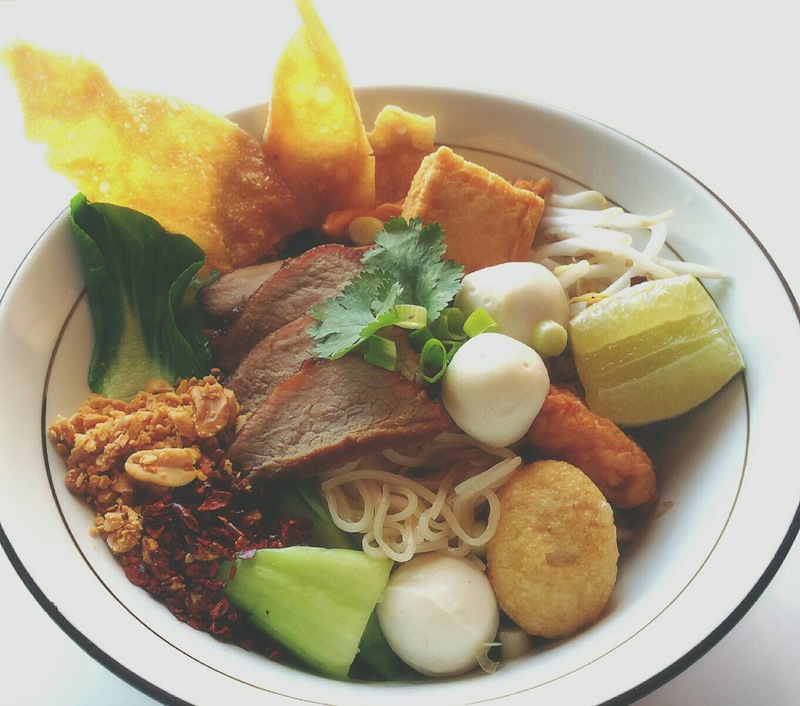 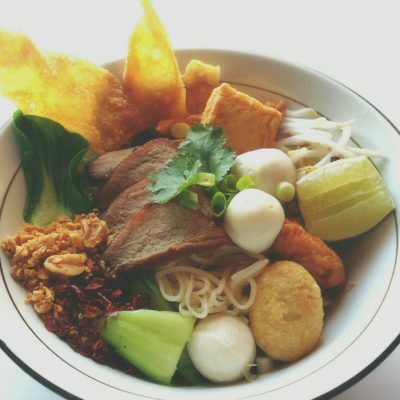 Steamed rice noodle with fish ball and roasted pork, bean sprouts, scallions, cilantro, napa cabbage, chili powder, crispy fried wonton & ground peanut. 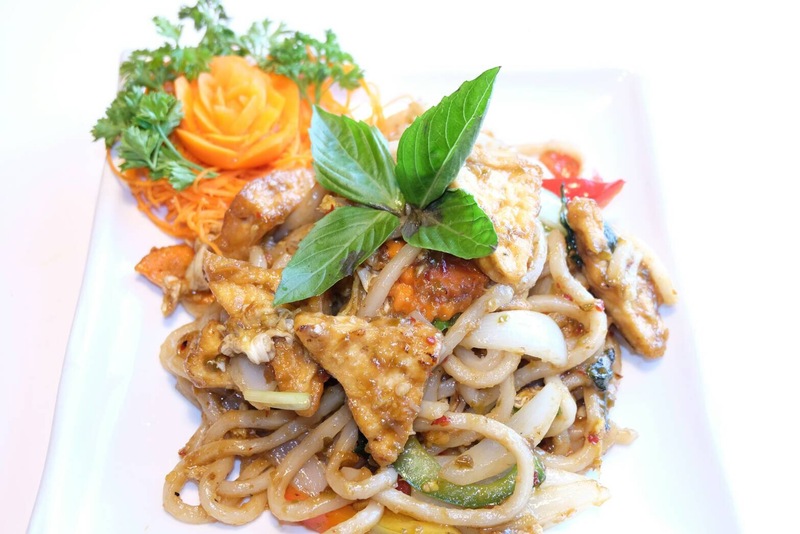 Spicy chicken Udon with basil leaves, bell peppers, egg, carrots, onions in spicy chili garlic sauce. 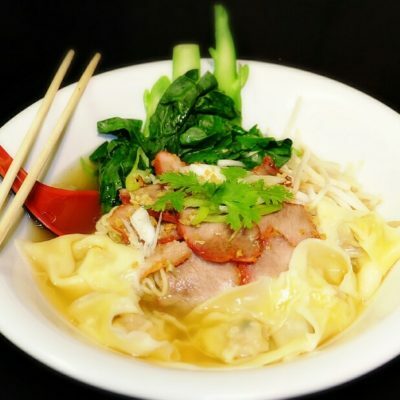 Flat wide noodles with pork, egg, Chinese broccoli and white pepper in sweet soy sauce. 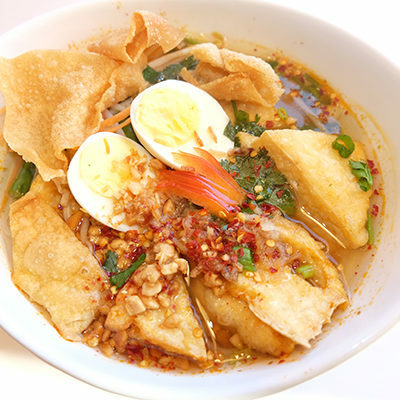 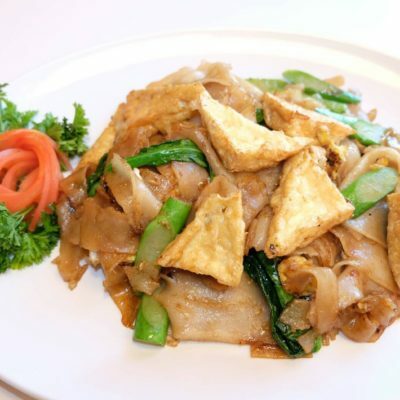 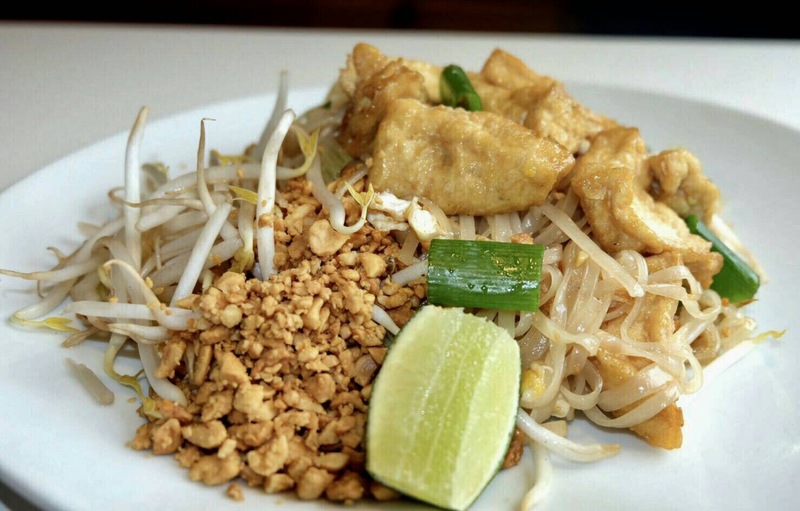 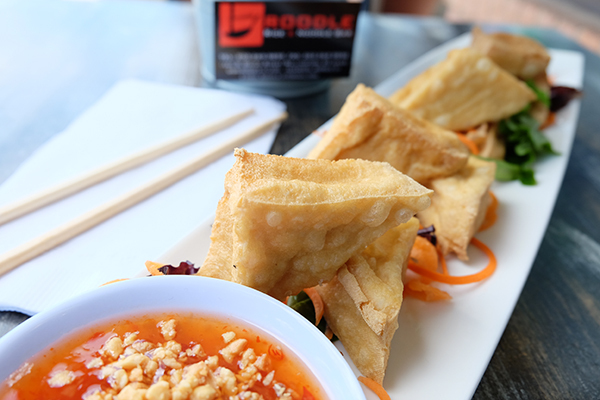 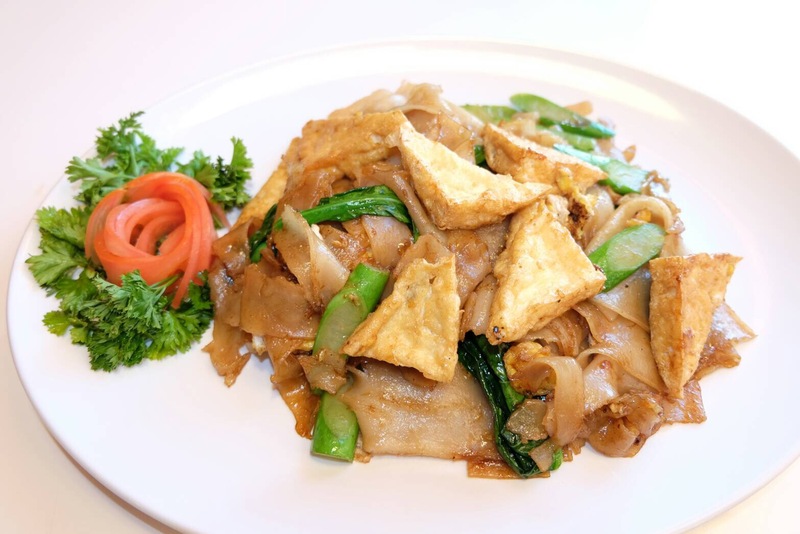 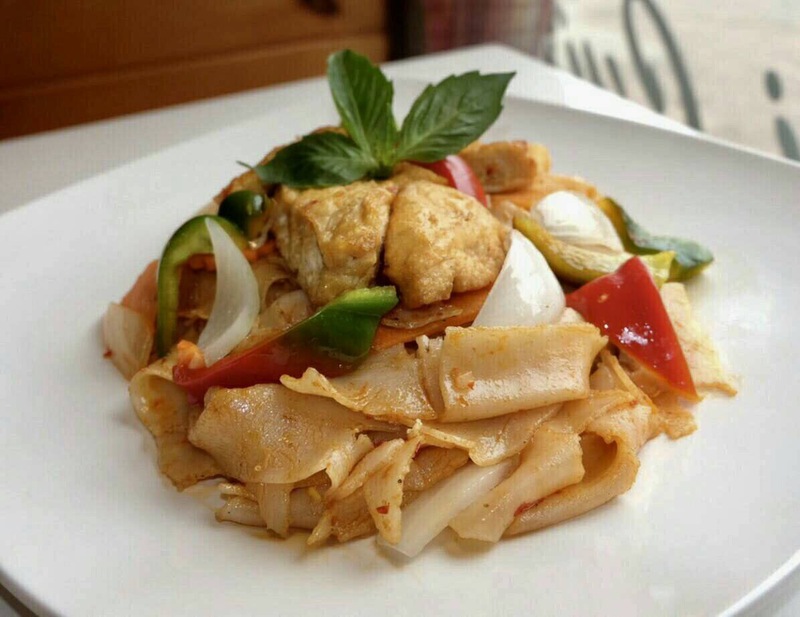 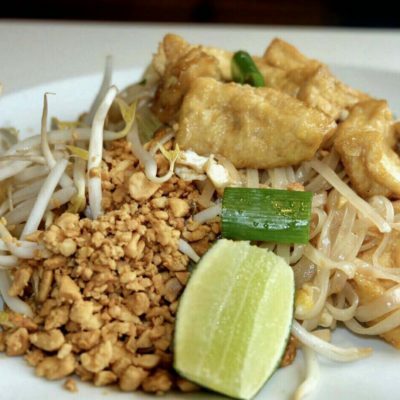 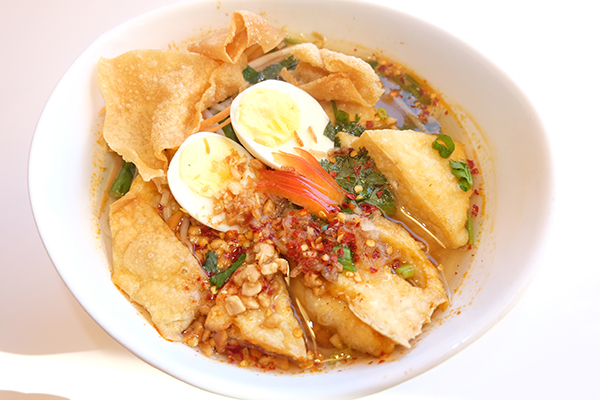 One of the most appetizing dishes, tofu, egg in hot and sour broth with fresh fettuccine rice noodles, bean sprouts, carrots, string beans, cilantro, scallions, ground peanuts, crispy wontons and chili paste. 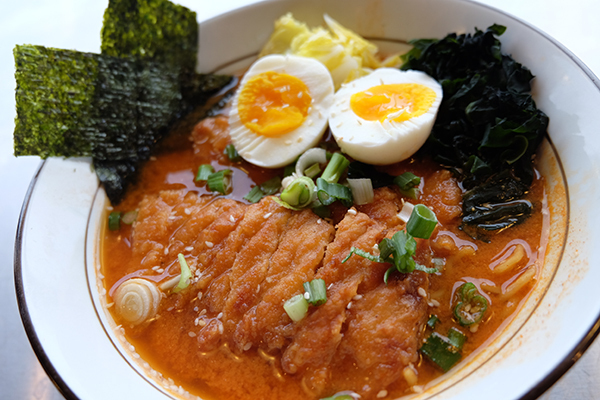 Ramen, Tofu, bean sprouts, seaweed, scallion & boiled egg with sukiyaki sauce. 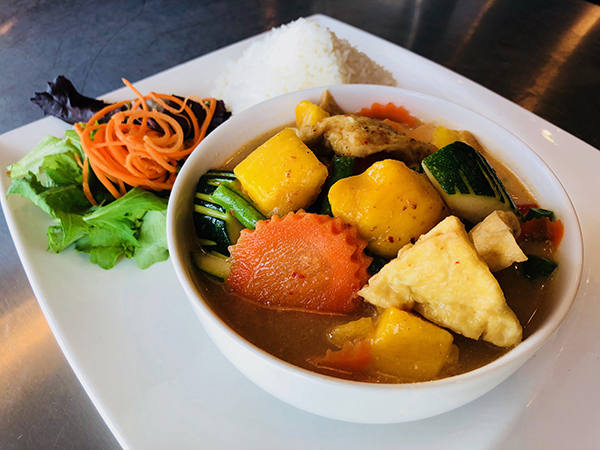 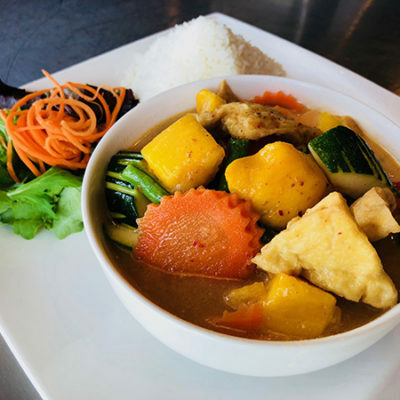 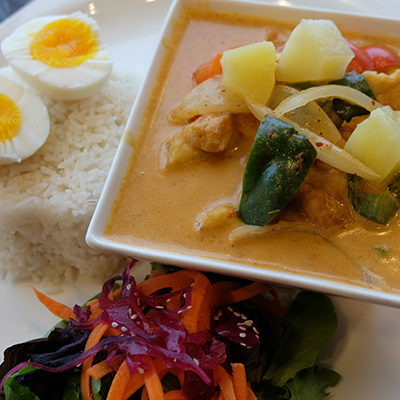 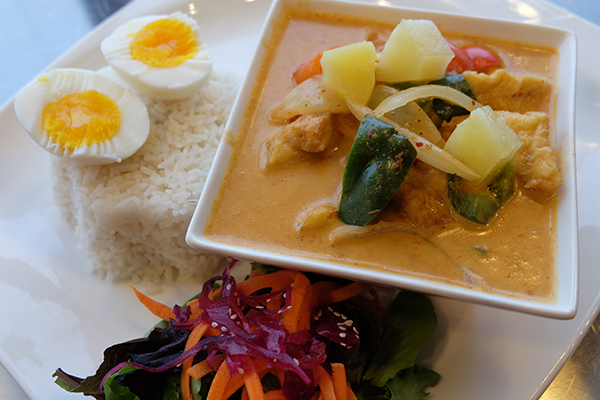 Pineapple curry with tofu cooked in coconut milk, pineapple, onions, bell peppers served with white rice and boiled egg. 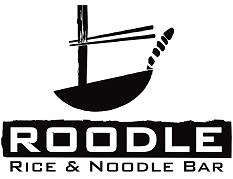 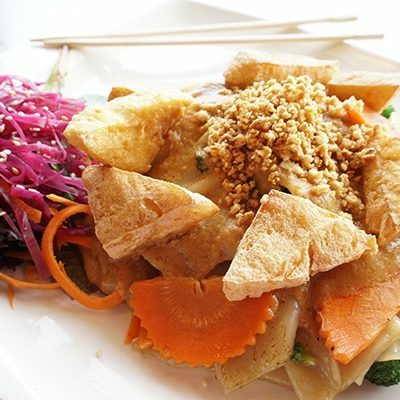 Flat wide noodles with tofu, broccoli, carrot in famous peanut sauce. 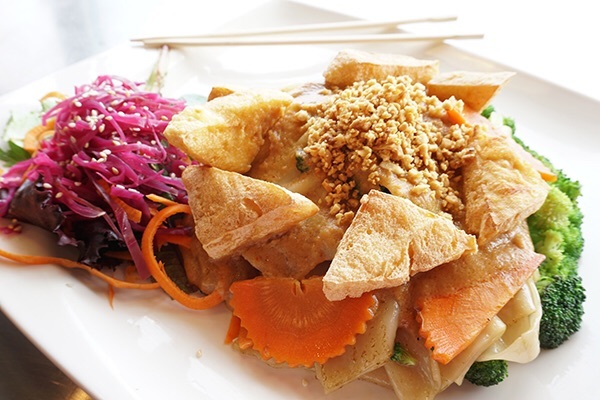 Deep fried tofu, broccoli, bell peppers, carrots, zucchinis, topped with peanut sauce. 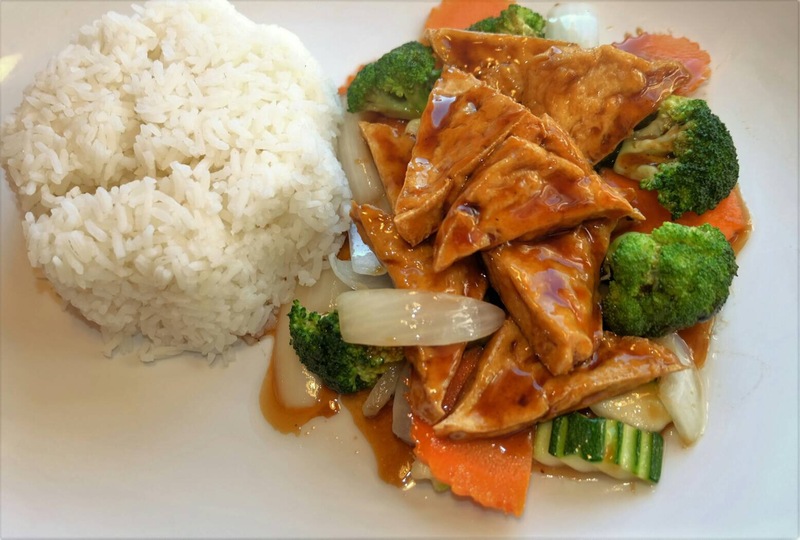 Fresh ginger with tofu, onions, bell peppers, celery, zucchinis, garlic, carrots, scallion in brown sauce. 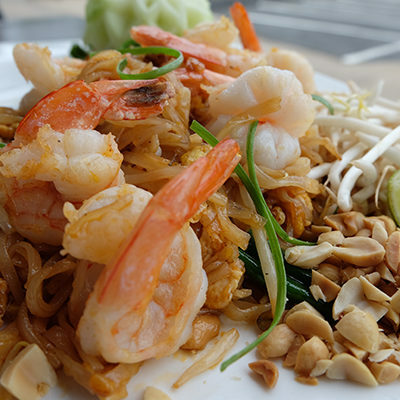 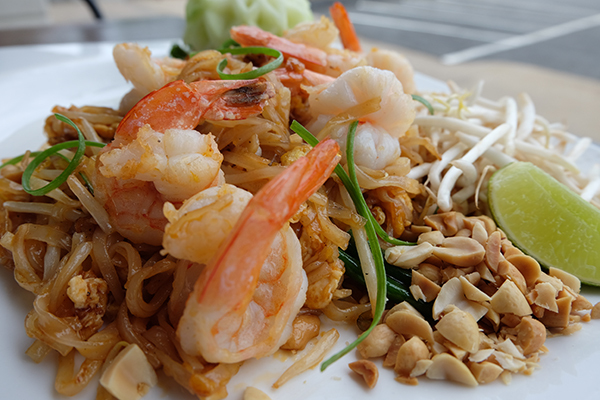 Classic stir-fried rice noodle with bean sprouts, scallions, egg and peanuts. 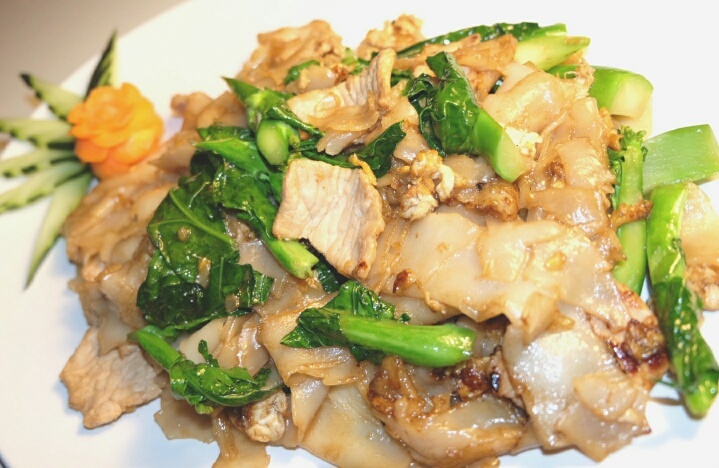 Flat wide noodles with tofu, egg, Chinese broccoli and white pepper cooked in sweet soy sauce. 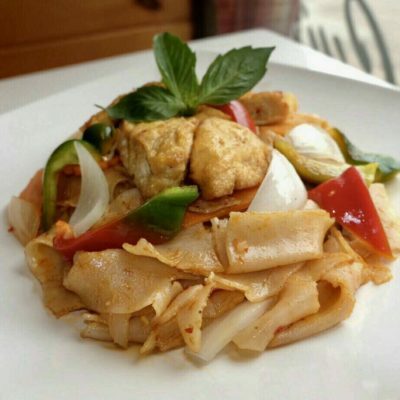 Delicious Flat wide noodles with tofu, basil leaves, bell peppers, egg, carrots, onions cooked in spicy garlic chili sauce. 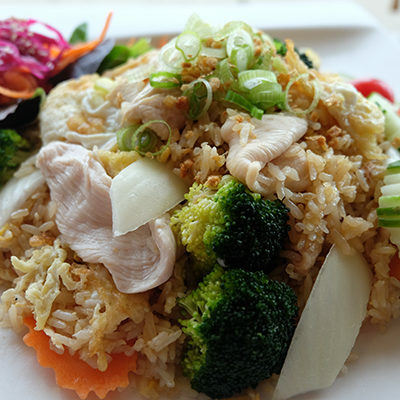 Stir-fried rice with tofu, carrots, broccoli, onion, scallion, garlic and egg. 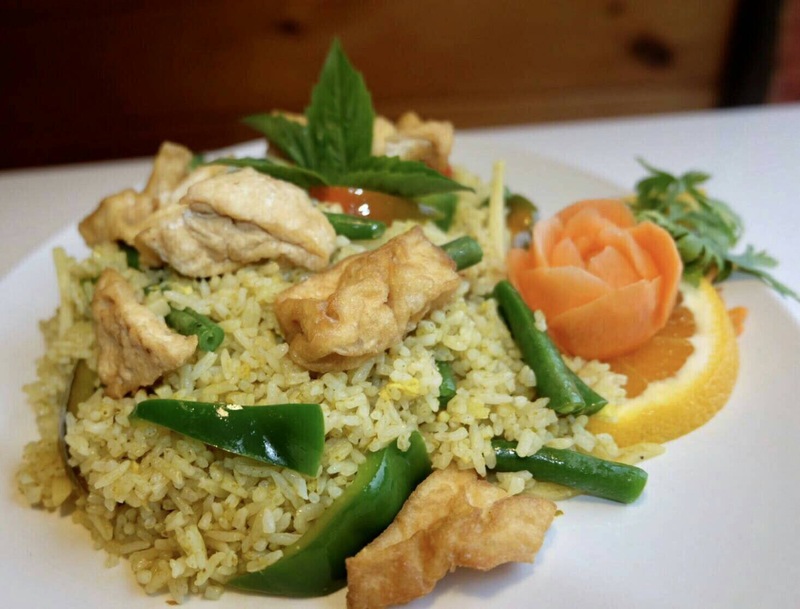 Delicious stir-fried rice with tofu, egg, string beans, bamboo shoots, zucchini, basil leaves and bell peppers in green curry sauce. 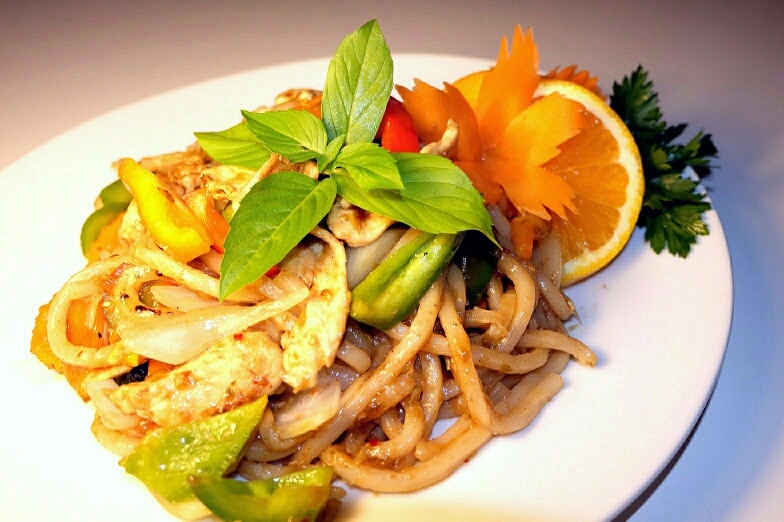 Sautéed Udon with tofu, basil leaves, bell peppers, egg, carrots, onions cooked in spicy garlic chili sauce. 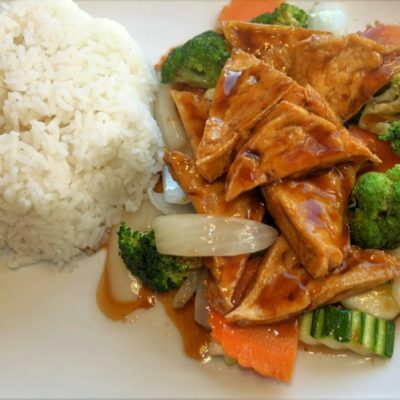 Fried fresh tofu on top of stir-fried mixed vegetables and topped with house teriyaki sauce served with white rice. 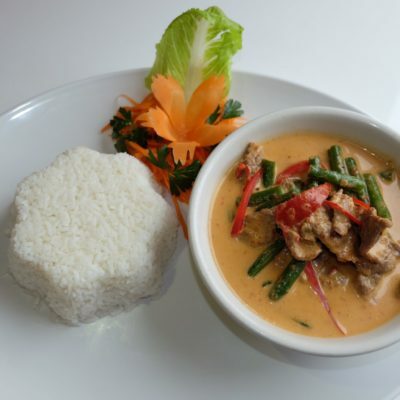 Yellow curry paste cooked in coconut milk with onions, tomatoes, zucchini, carrots, bell peppers and string beans. 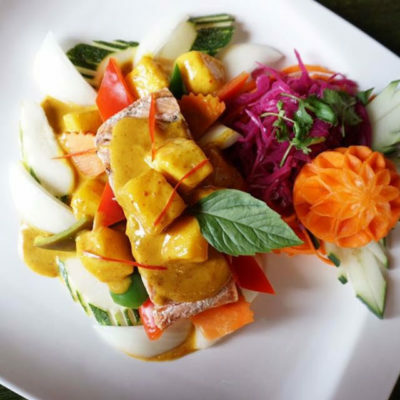 Red curry paste cooked in coconut milk with pumpkin, bell peppers, string bean, carrots, zucchini and basil leaves. 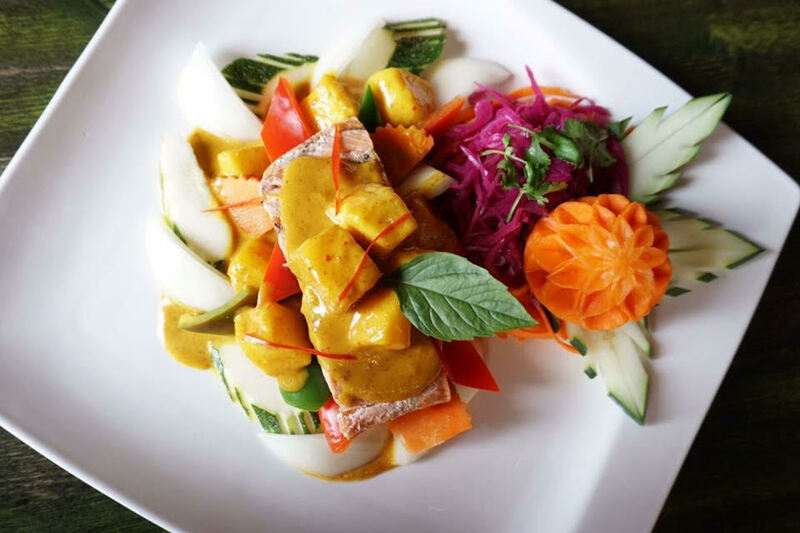 Red curry paste cooked in coconut milk with fresh mangoes, carrots, zucchini, onion and bell peppers. 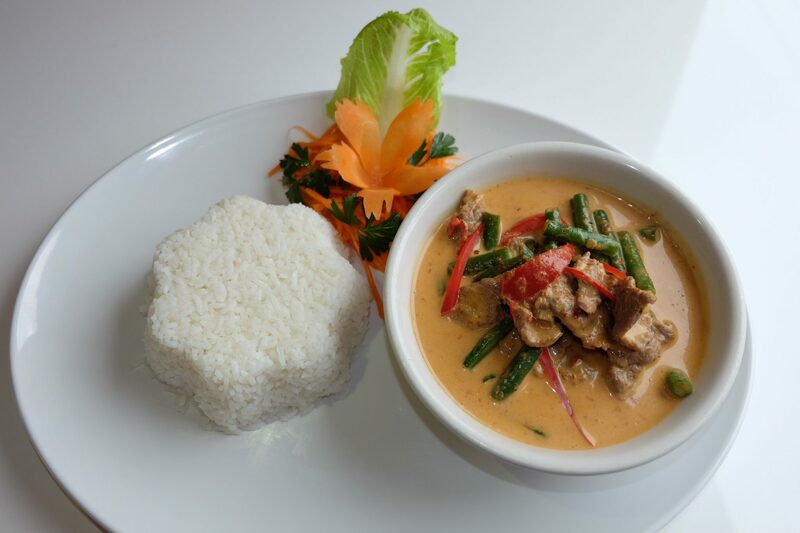 Beef Panang curry cooked in coconut milk, string beans, bell peppers, boiled egg and served with white rice. 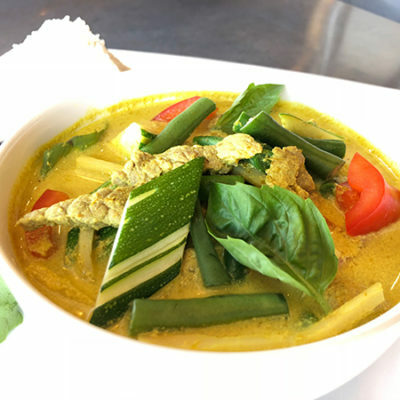 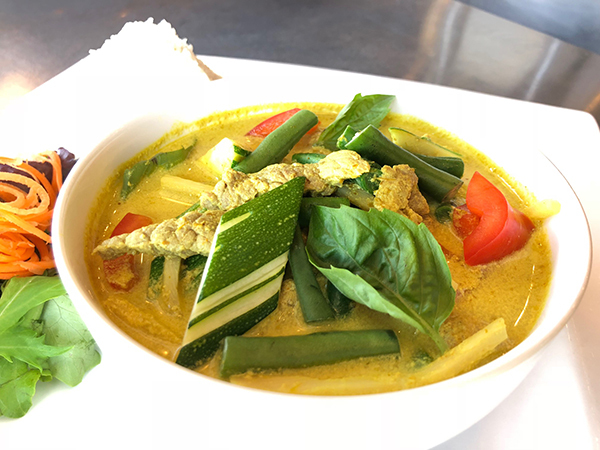 Green curry paste cooked in coconut milk with bamboo shoots, zucchini, string beans, bell peppers and basil leaves. 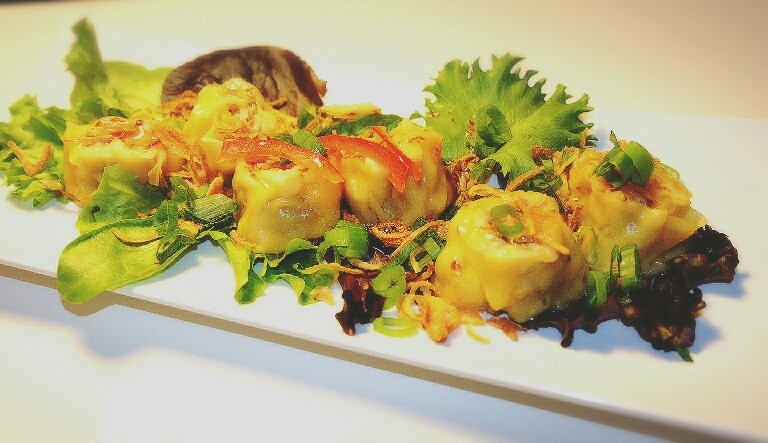 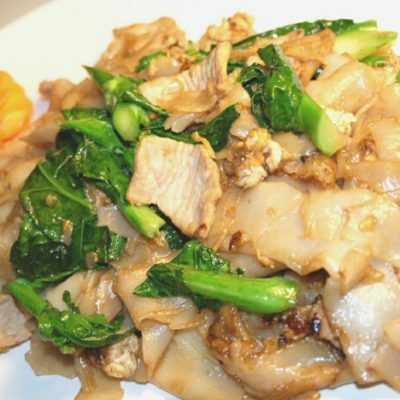 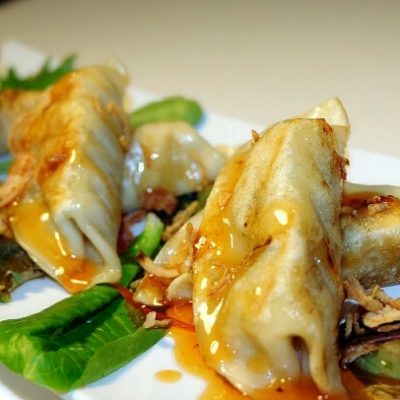 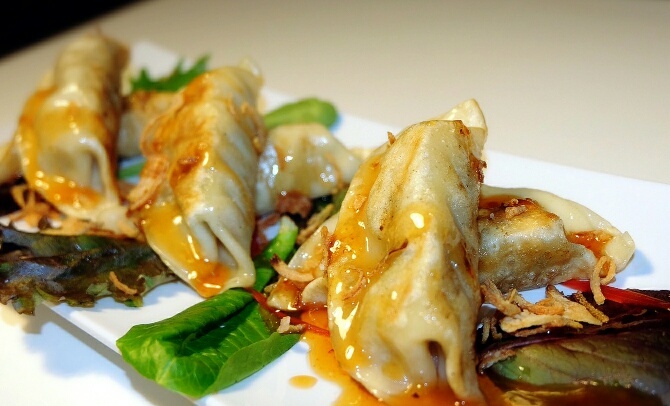 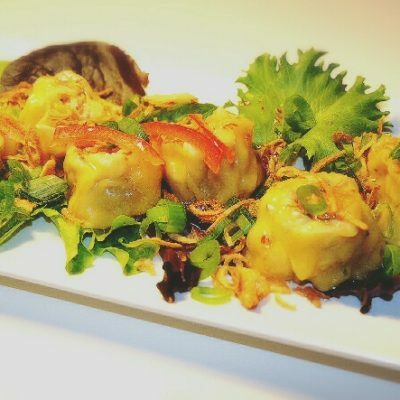 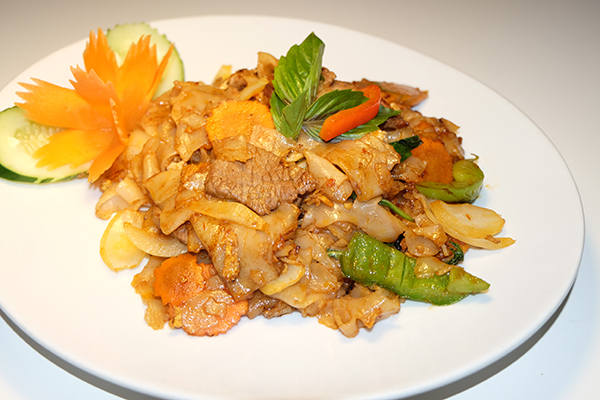 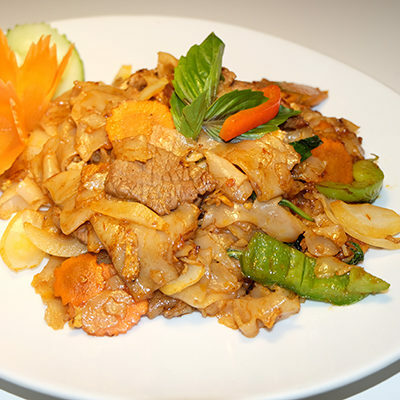 One of the most famous Th¬ai dishes. 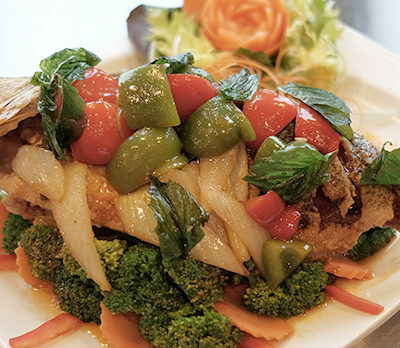 Deep fried whole fish topped with spicy three taste chili sauce, bell peppers basil leaves, broccoli, carrots and onions. 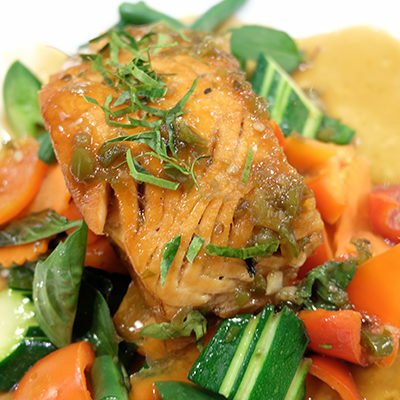 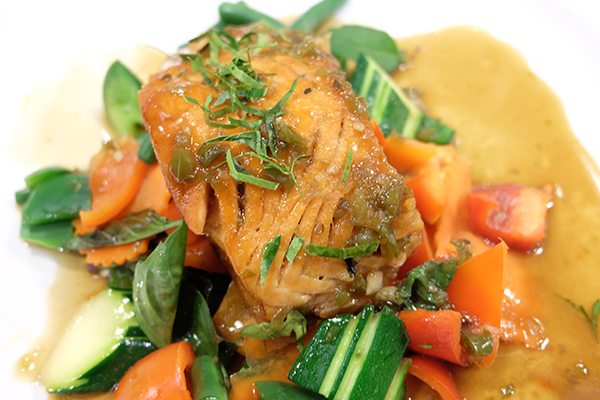 Charcoal grilled salmon, garlic, string beans, carrots, bell peppers, onions, basil leaves, zucchini and chili garlic oil. 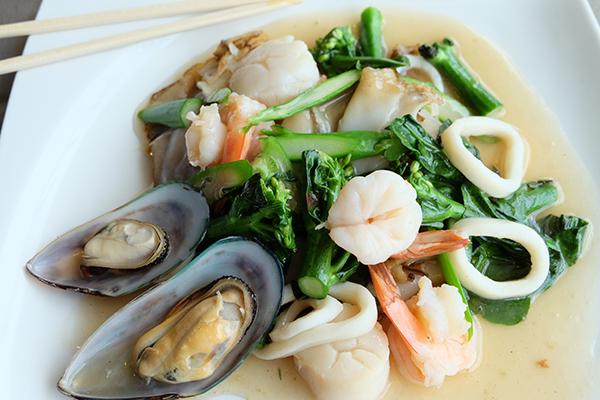 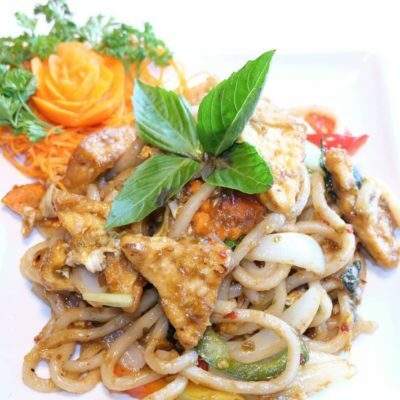 Stir-fried mussel, scallop, shrimp, string bean, bell peppers, basil leaves in spicy sauce on sizzling hot plate. 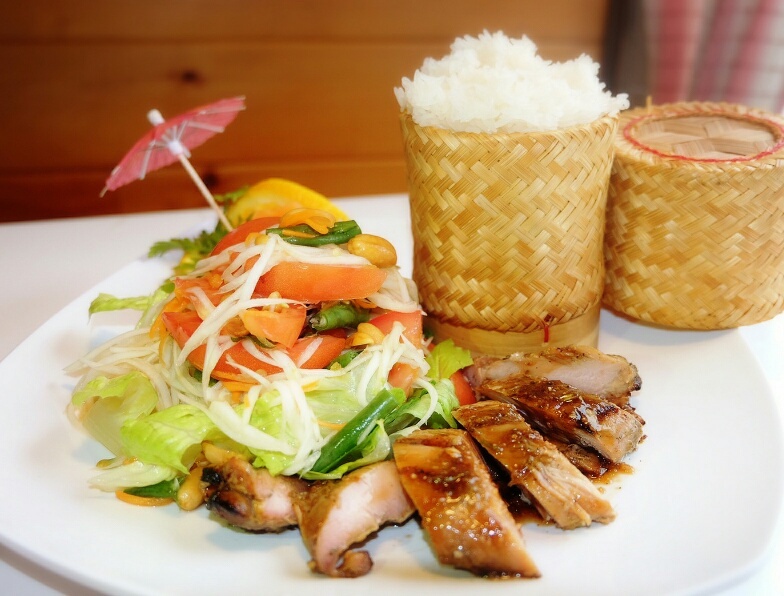 Well known dish from Northern of Thailand, grilled steak marinated in special house sauce, served with vegetables, coconut sticky rice and Thai spicy sauce. 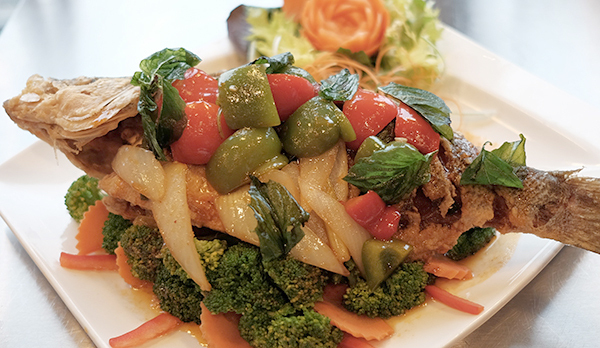 Delectable golden brown boneless Duck on the bed of steamed string beans, carrots and broccoli top with Thai homemade garlic sauce. 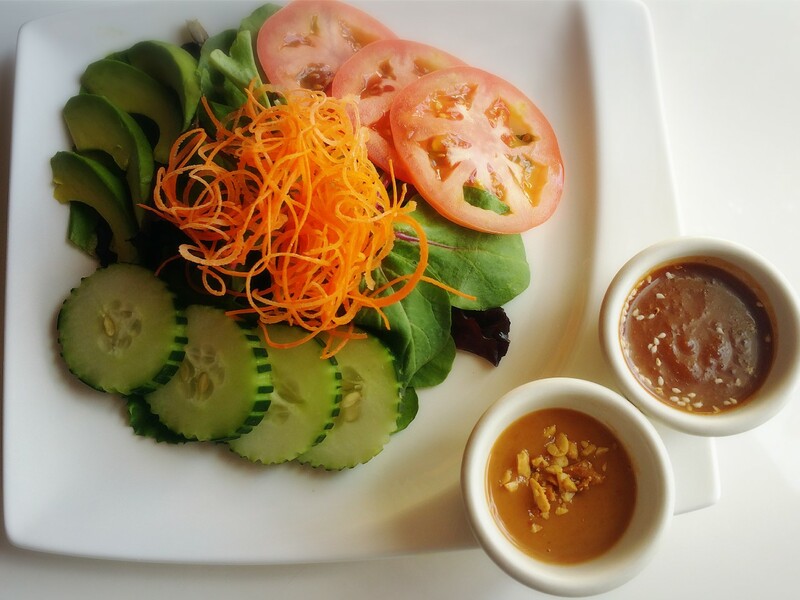 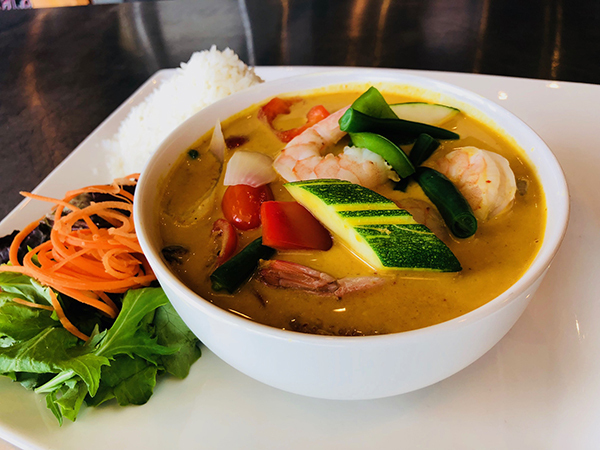 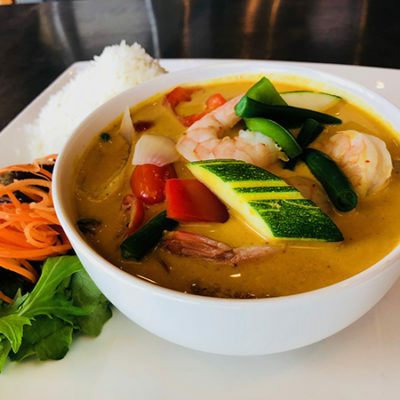 Shrimp topped with shrimp paste, sautéed with string beans, bell peppers, onions, carrots, celery, fresh chili & basil leaves. 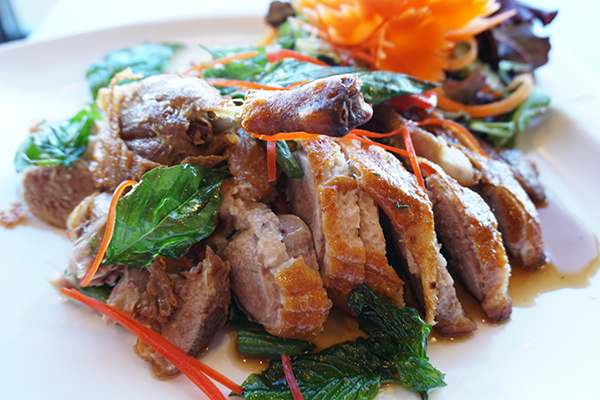 Sautéed crispy duck with string bean, bell peppers, onion, basil leaves in Prink Khing curry sauce. 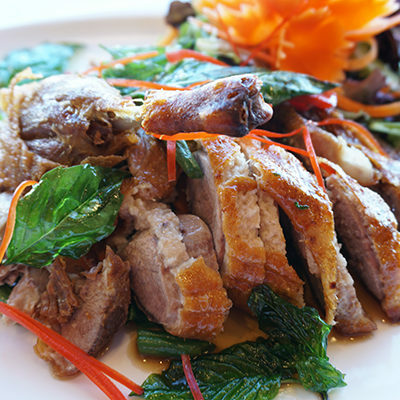 Juicy and crispy duck, crispy basil leaves, sautéed with fresh chili, string bean, bell peppers, onion, carrots and served with white rice. 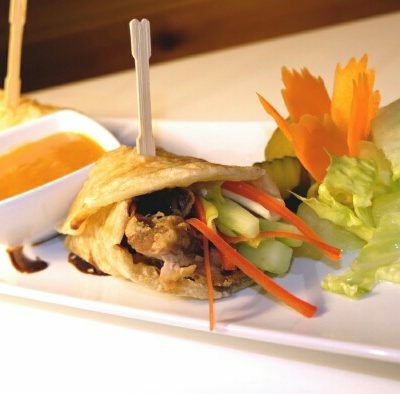 Fried banana wrap with coconut sticky rice & ice cream.